July 2011. We are just starting to work on this and it will be a work in progress for some time to come. Please understand that much of the newly added material has not yet been proof-read. 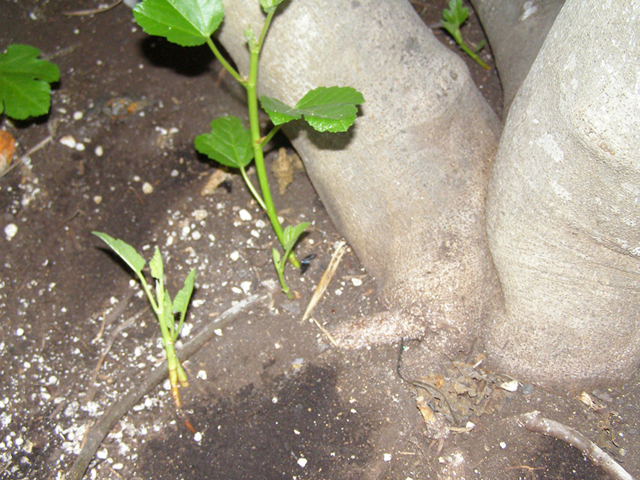 A propagation technique used to asexually propagate plant material, by stimulating root growth while the material being propagated is still attached to the parent tree.. Some people are allergic to the sap or latex within the fig plant and which, typically, oozes out of the branches, leaf stems, leaves, and even the fruit stem (if picked when not fully ripe) when they are cut or torn. For some this might mean a mild itchy sensation and a very slight rash, while other people might experieince extreme irritation, severe rash, and blisters simlar to a burn. Ants can damage fruit extensively. 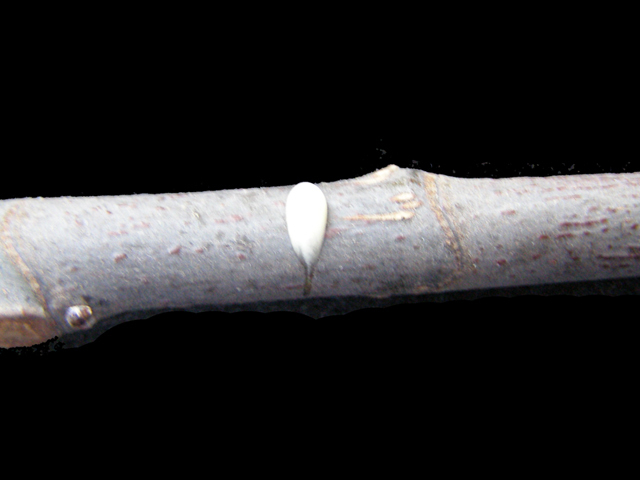 For trees that do not contact other trees or objects, and that have branches pruned so that no foliage touches the ground, ants can be controlled with Tree Tanglefoot - a sticky, non-drying product that, when applied around the trunk, creates an impassable barrier for ants and other climbing insects. Do not apply directly to the bark. First wrap with a non-porous material (plastic or ? ), and apply Tanglefoot to that material. Check frequently for bridging materials (leaves, dead bugs, dust, dirt, etc.) and rough up the surface to expose fresh material. It needs to be re-applied every so often. 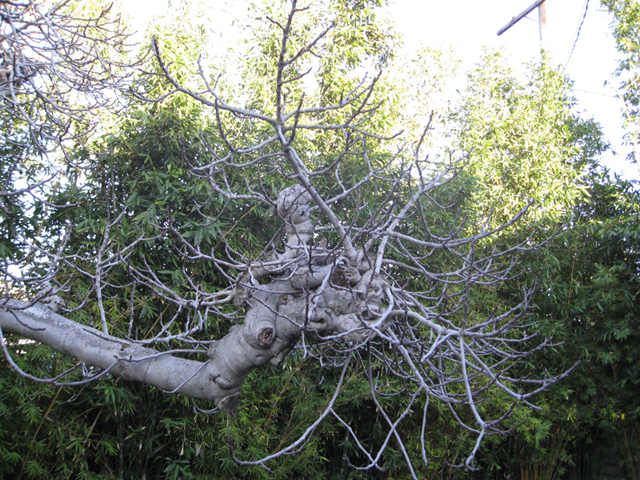 After applying the Tanglefoot barrier the tree can be hosed with water to remove insects. Spraying Malathion or other insecticides on tree trunks can create a temporary barrier to many ants, as long as they do not have an alternative route up into the tree. The Agricultural Research Service (ARS) is the U.S. Department of Agriculture's chief scientific research agency. Our job is finding solutions to agricultural problems that affect Americans every day, from field to table. The outer covering of the trunk, branches and roots of fig trees. It includes all tissues outside the cambium layer. Birds are a large problem. Reflective tapes, CDs, rubber snakes, plastic owls, and other devices may have a very brief deterrent effect on some birds, but the only truly effective bird barrier is screen or netting with openings small enough to prevent the smallest fruit-eating species in your area from squeezing through. Netting with a cell size of 1/2" x 1/2" is small enough to stop all birds. 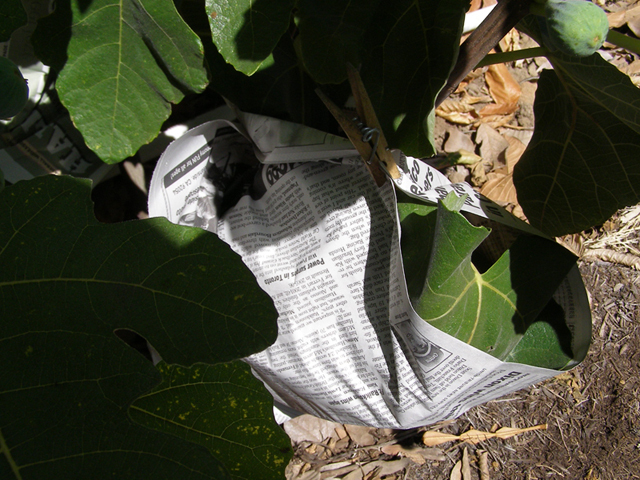 Using newspaper is another technique I learned from Richard Watts: protecting near-ripe figs by fastening old newspaper around them using clothespins, moving the protective cover as you harvest your fruit. This works quite well on smaller trees. The only truly effective bird barrier is screen or netting with openings small enough to prevent the smallest fruit-eating species in your area from squeezing through. Netting with a cell size of 1/2" x 1/2" is small enough to stop all birds. This will also stop many fig beetles, but a smaller opening size is required to keep all beetles out. The netting must cover 100% of the tree, by being bunched and tied around the trunk, and making contact with the ground around the entire circumference. Unless properly applied, plastic bird netting is frequently a death trap for birds, lizards, and snakes. 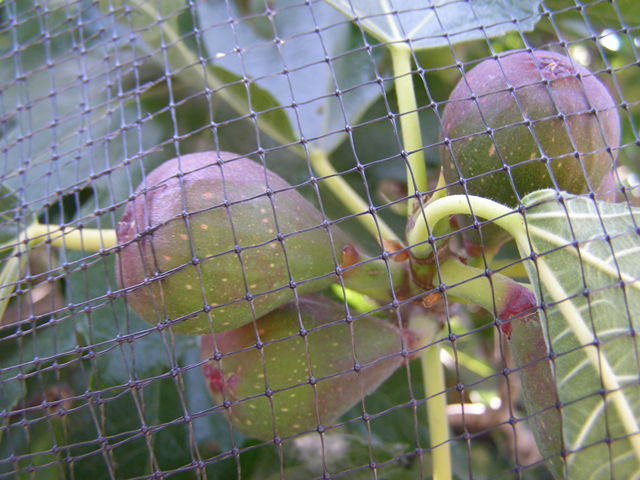 The most effective application is to drape the netting over some type of frame that holds the mesh away from figs and foliage, and keeps it taut enough to prevent birds from becoming entangled. 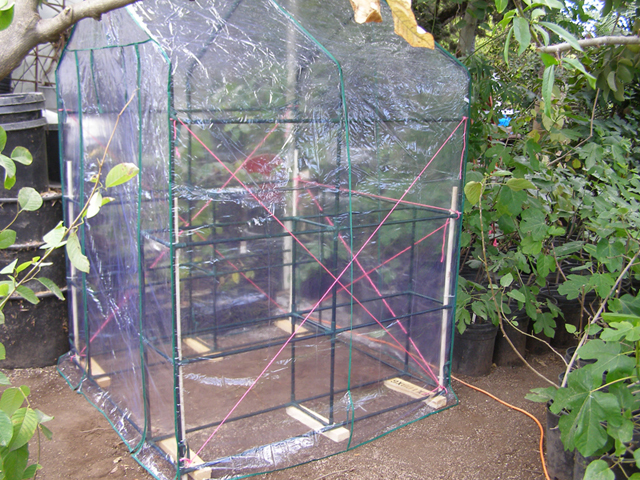 Roll up any areas of excess netting, such as at corners, and secure it with twist ties or clothes pins. 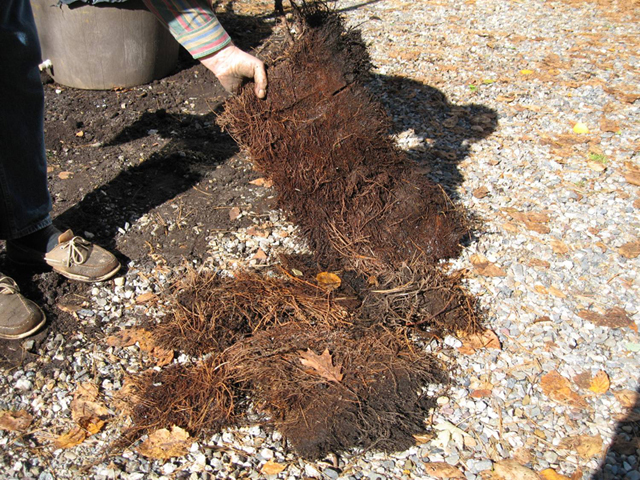 Bring the netting straight down to the ground and stake or weight it rather than gathering it around the trunk. If lizards or snakes occur in your area, encircling the tree with a low fence of plastic sheeting will prevent them from getting trapped in the mesh, as long as the netting overlaps the top of the plastic fence far enough to exclude birds, but remains well clear of the ground. Frames can be made of PVC pipe and fittings, or poles and string/wire, and can enclose a single tree or multiple trees. For individual trees, harvesting can be accomplished by raising the netting high enough to reach underneath and access the fruit. 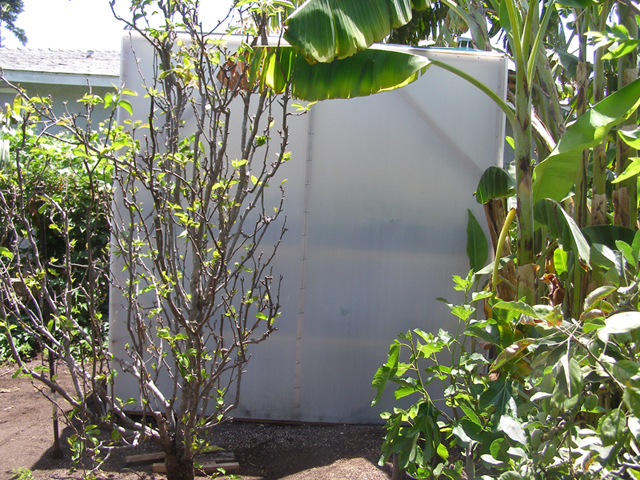 For larger enclosures, a permanent doorway can be built to allow full access to all of the trees inside. When using birdnet, you need to be careful to keep small birds and animals from becoming entangled in the netting. More books and articles can be found in the Figs 4 Fun Links. Fruit produced on wood which grew in the previous season. Also called "profichi" in Italian. Also known as the Spring crop. Breba producing varieties are important in cool and short season climates, and may be the only crop that ripens in those climates, such as the Pacific Northwest. 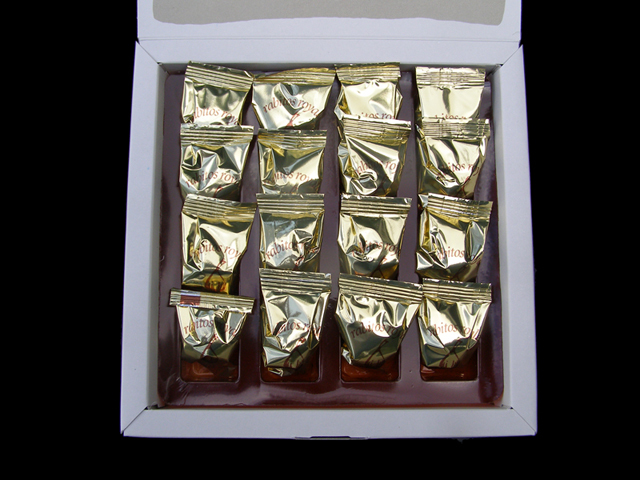 Generally refers to a plant structure that will generate new vegetative growth. They typically form at each leaf node, as well as the terminal end of each branch. 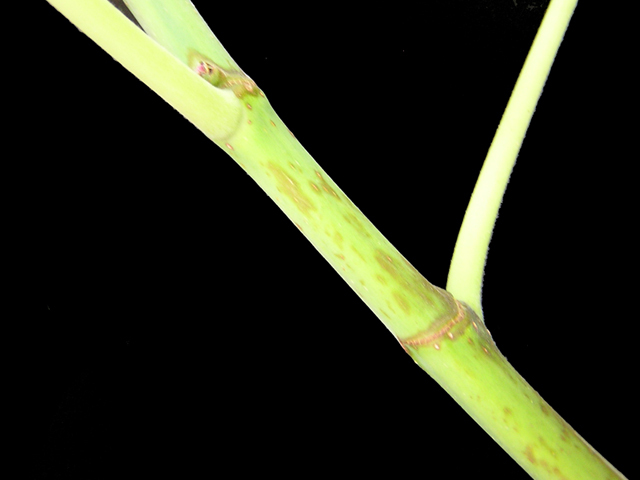 A protective covering that forms over the terminal bud, when growth ceases. It helps to protect the bud during the colder temperatures of winter. It is sloughed off when the bud begins to grow in the Spring. A layer of plant material directly beneath the bark. For Ficus carica it is green in color. 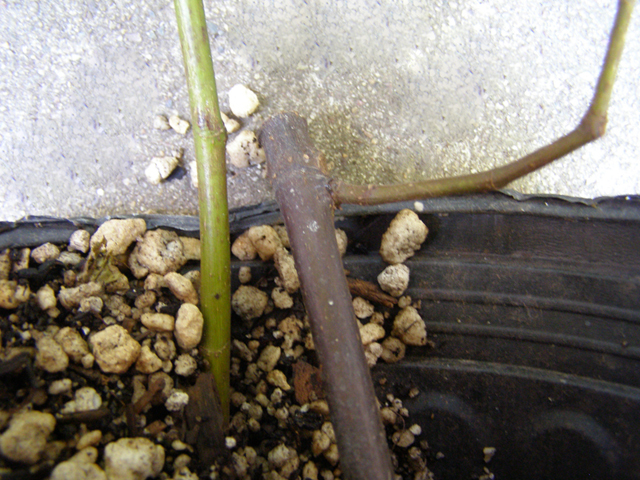 It is important, when grafting, that the cambium layers of the scion and rootstock make contact and heal together. This is the bonding point between the rootstock and scion. You can scratch off the bark to reveal the green cambium layer underneath. This is a quick test to see if the branch or cutting is still alive and viable. 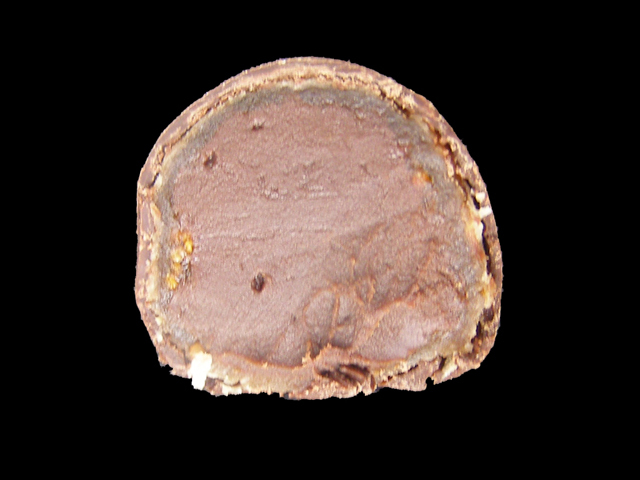 These are chocolate stuffed, liqueur infused, chocolate covered figs. 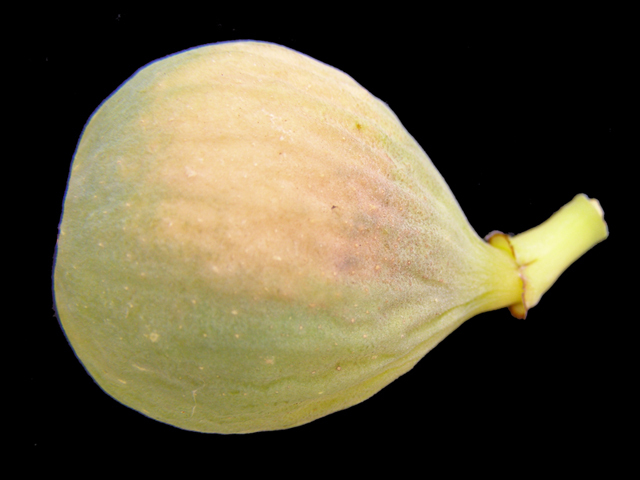 Functionally male fig or synconia, which produces pollen necessary for pollenating Smyrna type figs and the second or main crop of San Pedro type figs. They also contain short-styles female flowers, which, when pollenated, produce a sort of pseudo-flesh. Closed "eye" varieties are valued for their resistance to insects and spores which lead to spoilage and mold problems. One of 4 types of Ficus carica which comprises the majority of figs which the home gardener encounters. Well known examples are Black Mission, Brown Turkey, Celeste, Kadota and White Genoa. "Common" refers to those figs which produce an edble fruit (breba crop and/or main crop) without requiring pollination. A fig breeder, who was responsible for a breeding program at the University of California, in the 1950s (?). The goal of the program was to develop a common fig which would have all the characteristics of the smyrna-type fig, Calimyrna. Among his written articles and books, the most often cited is The Fig. 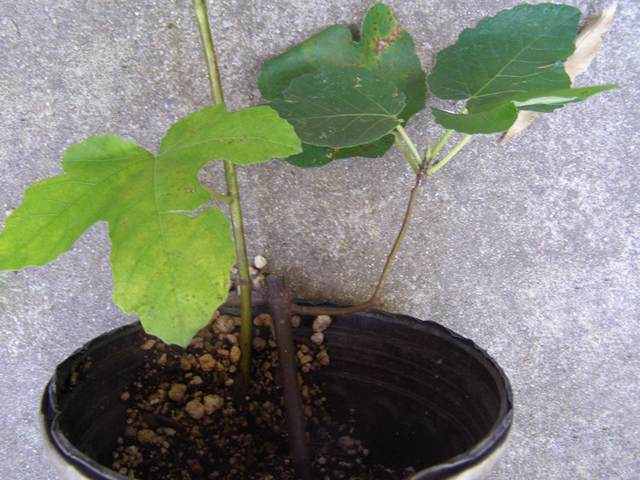 Containers or pots are often used for growing figs. The portability allows them to be moved into sheds, garages, etc. for winter storage. 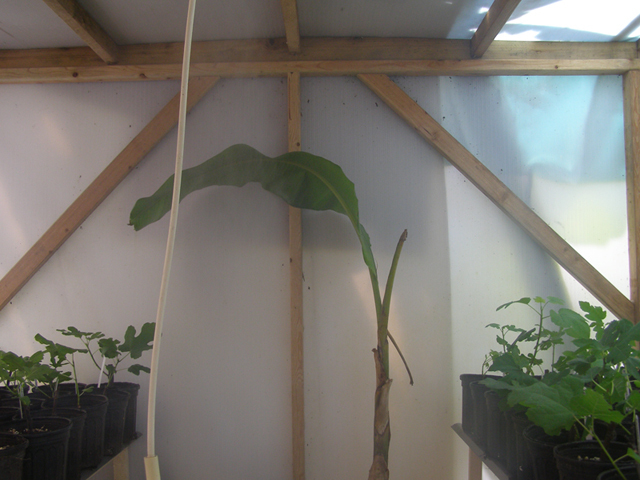 By limiting root growth, they also help dwarf the size of trees. 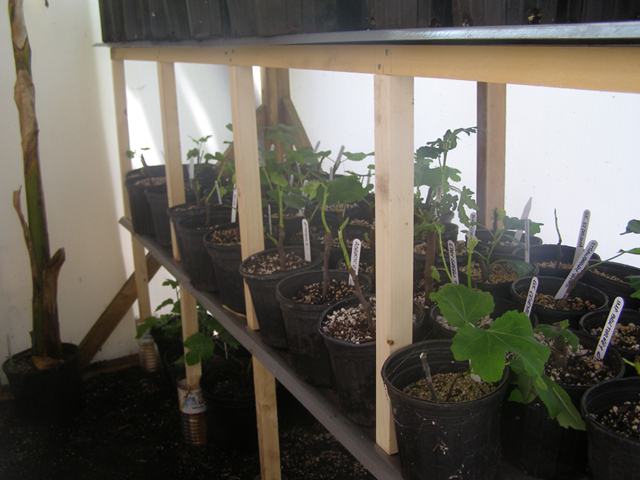 See: Bill's Figs for a self-watering system for potted figs. 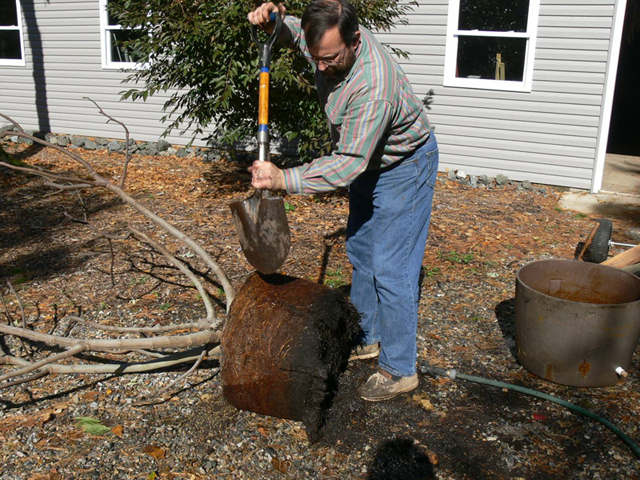 See: Root Pruning for the care and health of potted trees. Cracking should not be confused with splitting. Cracking results when the expansion of the fleshy part of the fig occurs faster than the expansion of the skin? This usually occurs in the last few days of ripening, and thus is one of the indicators of how close a fig is to being ripe. 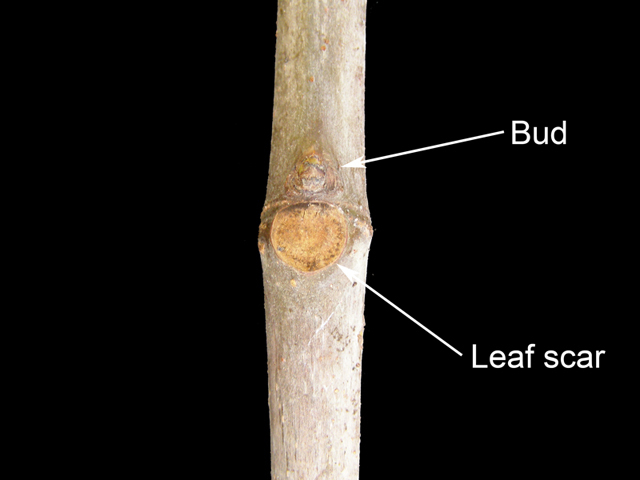 A cutting is a portion of a tree branch which is typically removed from the parent tr tree in order to propagate additional plants which are identical to the parent tree. 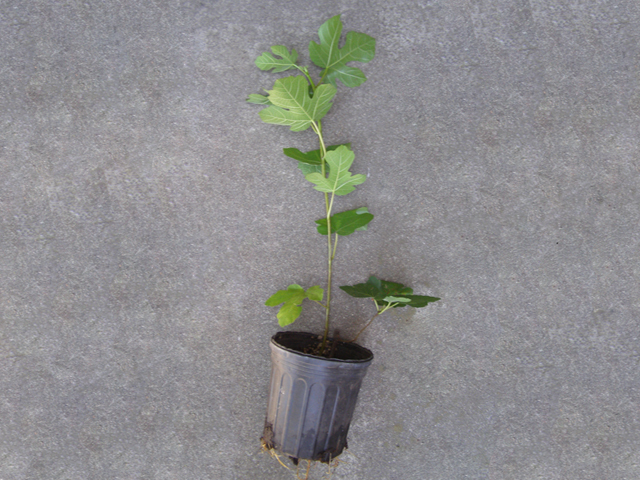 Cuttings may be rooted or may be used for grafting, using a variety of techniques. 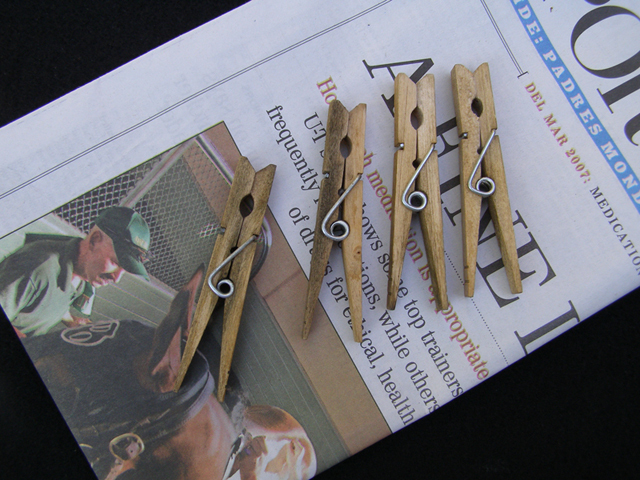 There are many sources of cuttings. The simplest is taking cuttings from your own tree, or the trees of family, friends and neighbors. These are usually trees that have proven to be successful at you location and with your climate. Garden clubs and internet forums are good places to meet people and acquire or exchange cuttings. 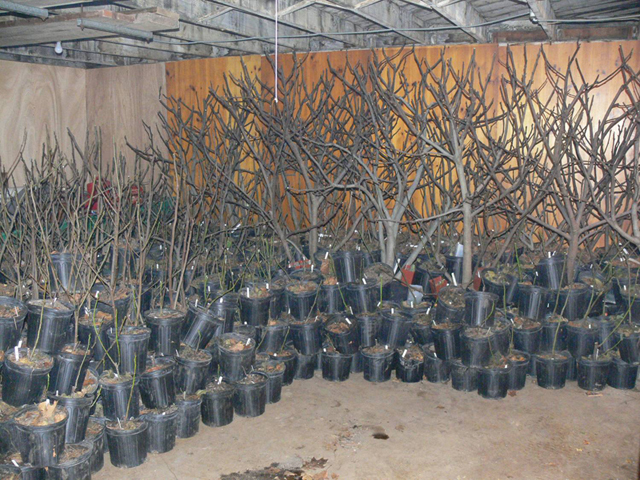 Most chapters of the California Rare Fruit Growers have scion exchanges early each year where cuttings can be obtained. The USDA through the UC Davis distributes cuttings of approximately 150 varieties, if they are ordered prior to December 1. These cuttings are generally shipped in Late February through early April. Many varieties are also available, in February, from Encanto Farms, which ships cuttings from the Figs 4 Fun Collection, and some other private collections in Southern California. Importing cuttings from foreign countries into the United States requires a Post Entry Quarantine Permit from the USDA. This term generally refers to branches or cuttings which are no longer actively growing, and shed their leaves, usually during the fall, in preparation for winter. 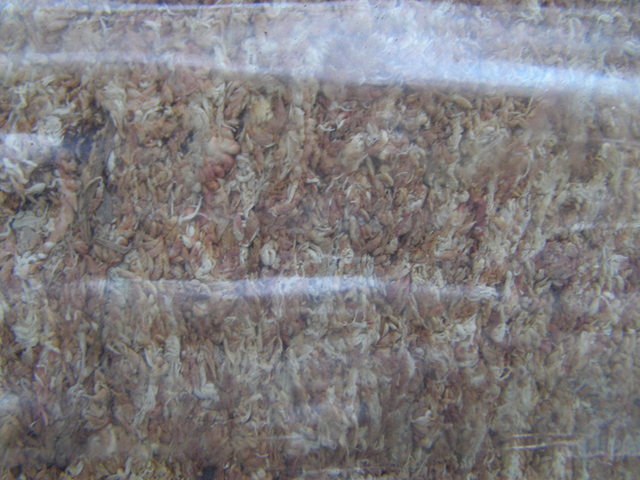 Dormant wood is generally brown in color, indicating a change in the composition of the cells in a process known as lignification. 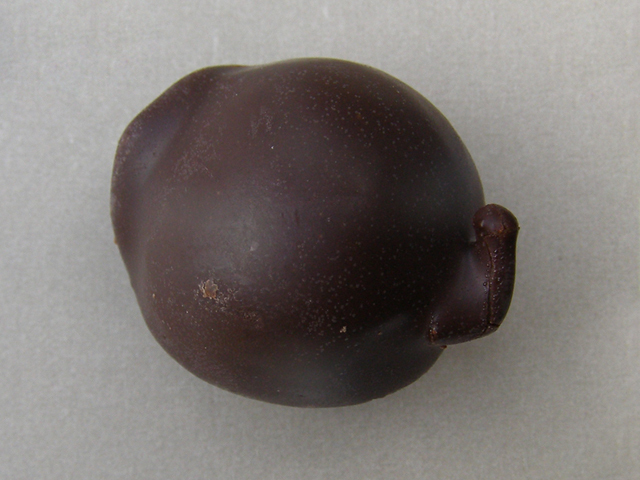 Figs that have an open ostiole, or eye, are susceptible to damage from this tiny beetle. 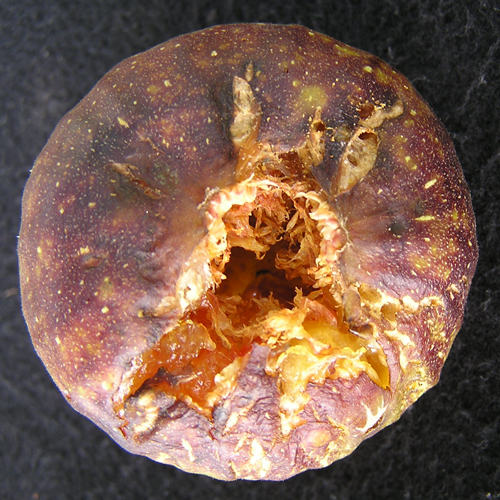 Dried fruit beetles enter the fig through the ostiole and introduce yeasts and other microorganisms that cause severe souring and rapid deterioration of the fruit. 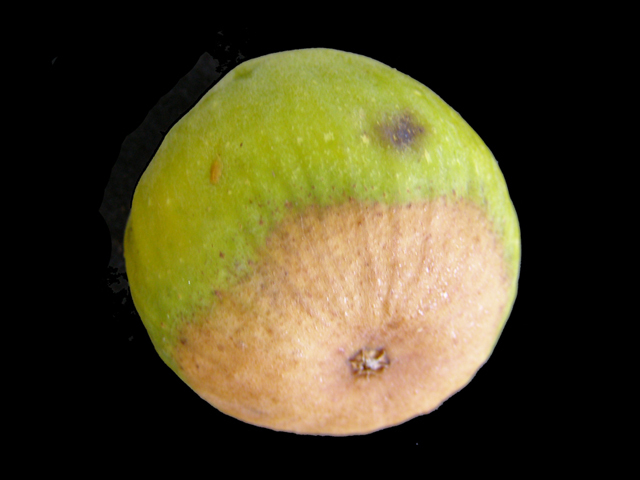 In regions where this pest is found, the best way to avoid souring is to grow only closed-eye varieties. Small figs can be dried whole, but large varieties may need to be cut in pieces to prevent spoilage during the drying process. In warm areas with low humidity, some figs can be dried outdoors in the sun if protected from birds and insects. Electric fruit dryers do an excellent job as well, but vary widely in their quality and in the amount of fruit that can be dried at one time. The best varieties offer multiple drying racks and fan-driven air circulation for uniform heat distribution and moisture removal. There are probably few if any truly dwarf fig trees. Tree size is usually controlled by pruning, proper application of fertilizer (avoiding excessive amounts), and root control. Some trees are more vigorous growers, by nature, and some will, ultimately be larger than others. Are Gillette, Crosic, and Cordelia also edible caprifigs? Maybe synonyms for the same fig? Possibly Pingo de Mel, per Gustav Eisen. 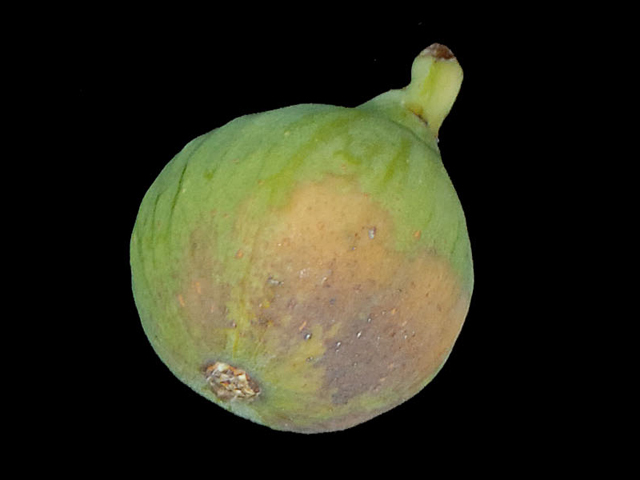 The fig known as Caprifig Q in the USDA/UC Davis collection, is edible. Most fertilizers are rated on the amount of Nitrogen (N), Phosphorus (P), and Potassium (K) which they provide to a plant. In addition, there are other nutrients and minerals, often called micro-nutrrients or trace minerals which might be included in a particular fertilizer mixture or product. Some of these are Manganese, Boron, and Copper. Sulfur and Lime are probably not, strictly speakihng, fertilizers, but they can be used to affect soil quality and soil pH, which can alter the way that a plant is able to absorb other nutrients. Also known as the Western Green June Beetle. 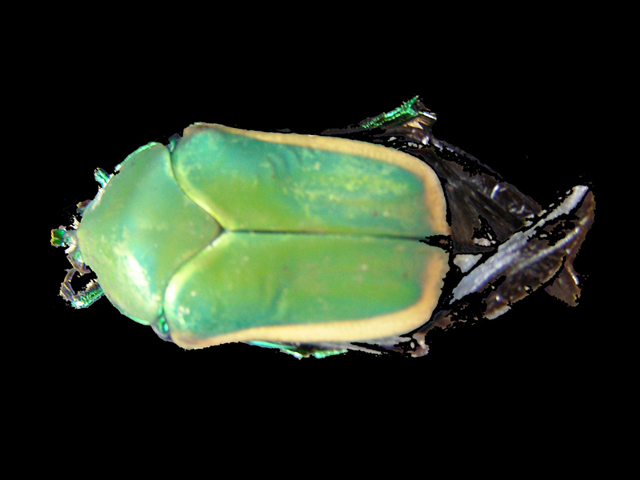 These large scarab beetles can decimate figs and other crops in the southwestern USA and northern Mexico. They often feed in groups, clustered tightly around a fig as they devour it. Adults are active during the day and can be stopped with 1/4" x 1/4" plastic netting, but the more common 1/2" x 1/2" size allows many of them to pass right through. They lay their eggs in leaf litter beneath the tree, producing large white grubs that feed on decaying matter and tree roots. 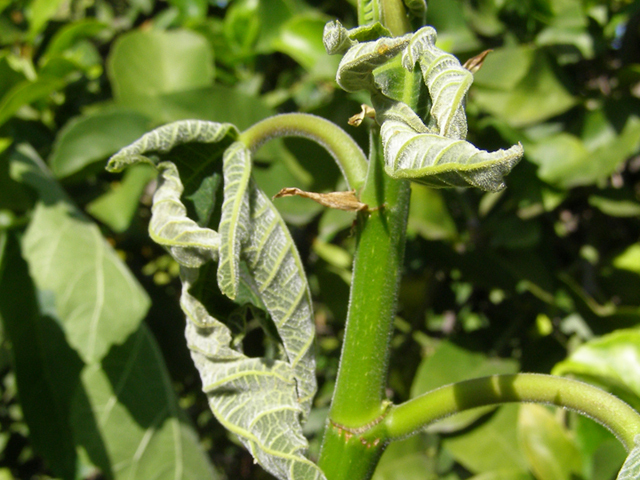 A virus that infects fig tree and plants. It is considered ubiquitous worldwide by the USDA. Infected plants may or may not show any symptoms. Most obvious symptoms are patterns and patches of discoloration on the leaves, distorted leaves, and poorly growing branches or plants. Distorted leaves seem to be more pronounced when the weather is cool and damp, which is more common in the Spring and Fall. Cause. 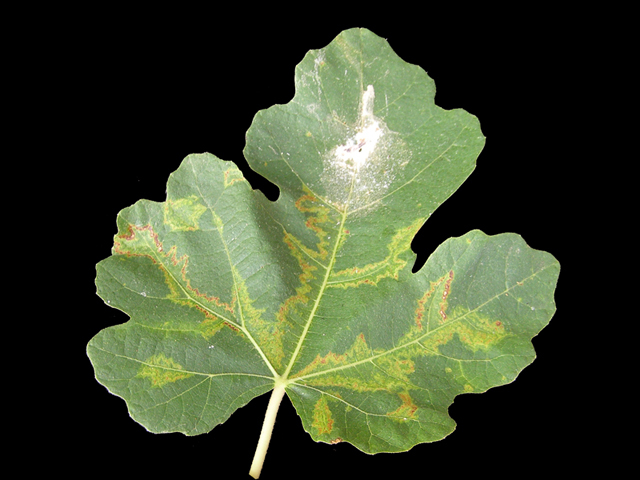 The causal agent of the common mitebome fig mosaic has not been identified, but the symptoms suggest it may be a virus. The pathogen can he vectored by both the larval and adult stages of the mite Aceria ficus (Corte) (Flock and Wallace 1955). The pathogen is also transmitted by grafting, but apparently is neither seedborne nor mechanically transmitted (Smith 1972). 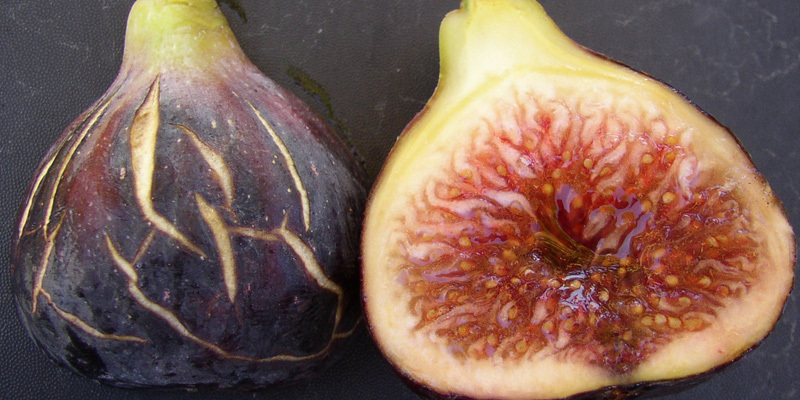 In contrast, a fig mosaic disorder in Italy is associated with a totally different agent. sowbane mosaic virus (SMV} (Quacquarelli 1971 ). Easily transmitted by sap inoculations. 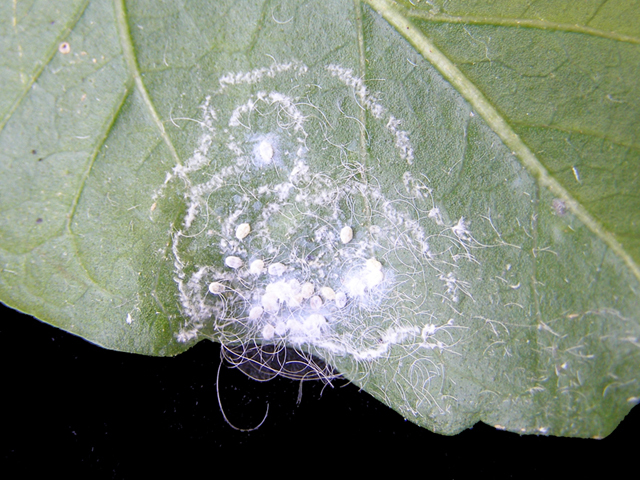 SMV is seedborne and is vectored by a variety of insects (Kado 1971) but not by mites. A recent report by Grbelja and Eric (1983) indicates the association of a polyvirus with a type of fig mosaic occurring in Yugoslavia. 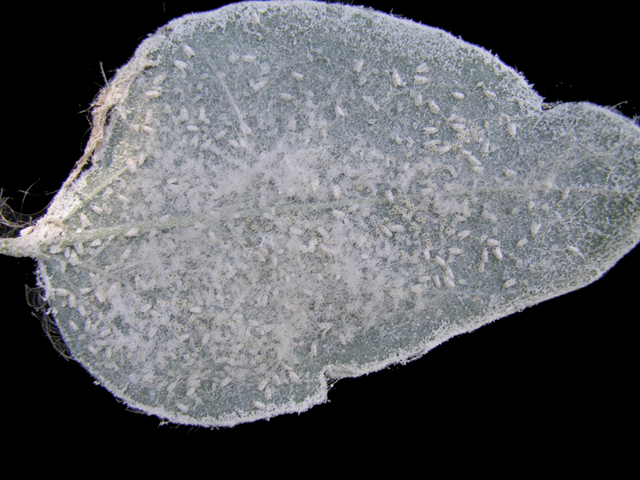 This filamentous (750 to 800nm) virus was transmitted in a nonpersistent manner by aphids (Myzm pemcae); it also could be mechanically transmitted to a few Nicatmna species. Epidemiology. ln California. the disease appears to be widespread. 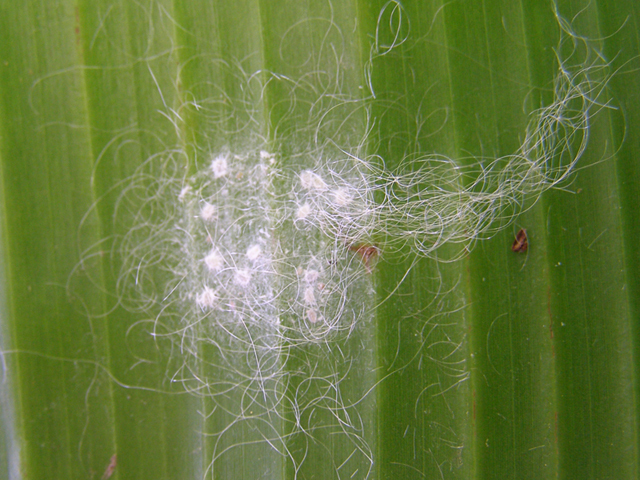 which is not surprising since it is vectored by a widely distributed eriophyid mite. 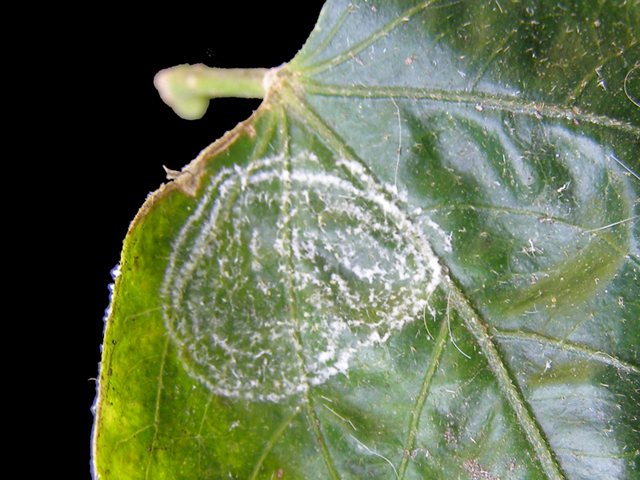 This mite infests bud scales and young leaves and at times cause: the abscission of leaves and stunting of twigs; on the Adriatic cultivar it can cause early defoliation of the terminal twigs. The pale yellow mites range from 0.00E to 0.008 inch long and have two pairs of legs. 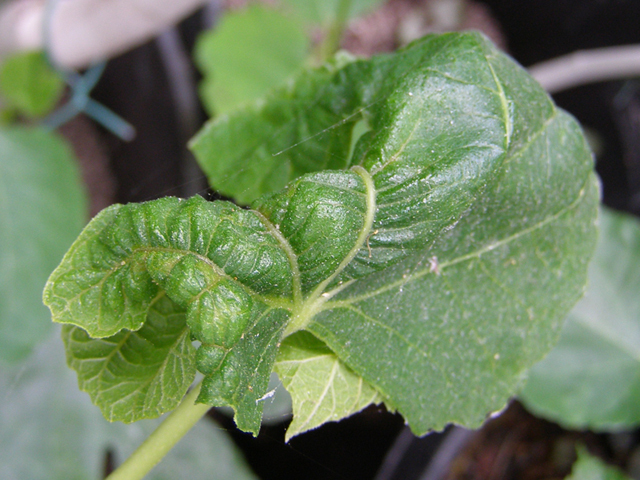 The feeding of mosaic-free mites on disease�free seedling plants induces leaf distortion and slight chlorosis and russeting, but no mosaic symptoms (Flock and Wallace l95S). These symptoms evidently represent a toxicogenic reaction of the plant. 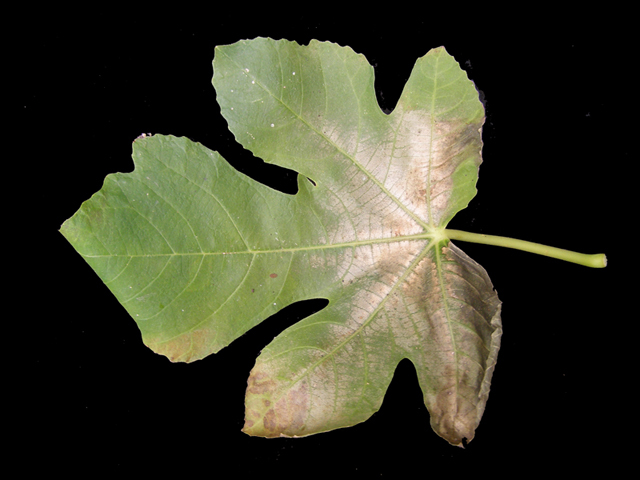 Frost is not automatically harmful to fig trees. A lot depends on the varitety and the condition of the branches. If branches are dormant and fully hardened, they can withstand colder weather than branches that are still "green" or not dormant. While there are reports of trees in colder regions that survive outdoors during the winter, with snowy or freezing conditions, there is no comprehansive information on which varieties are better able to endure such conditons. Most people take measures to protect their trees from harsher winter conditons. Generally regarded as the reason for growing fig trees, apart from their ornamental value. 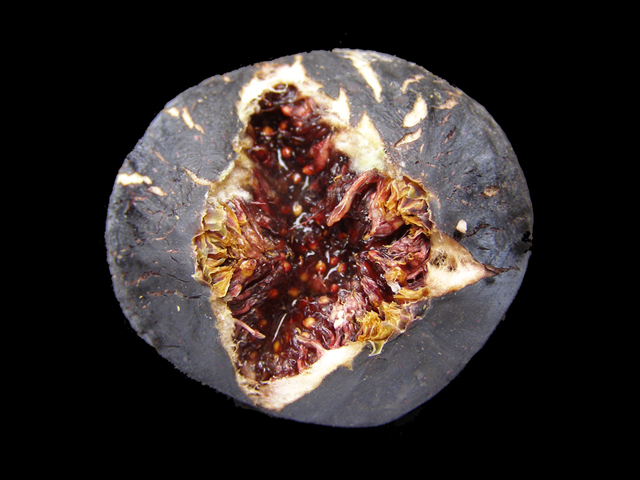 Botanically speaking, the fig synconium has a multitude of fruits within it, with each fruit representing a separate flower on the inside of the syncomium. In layman's terms, the entire syncomnium is referred to as a "fruit". 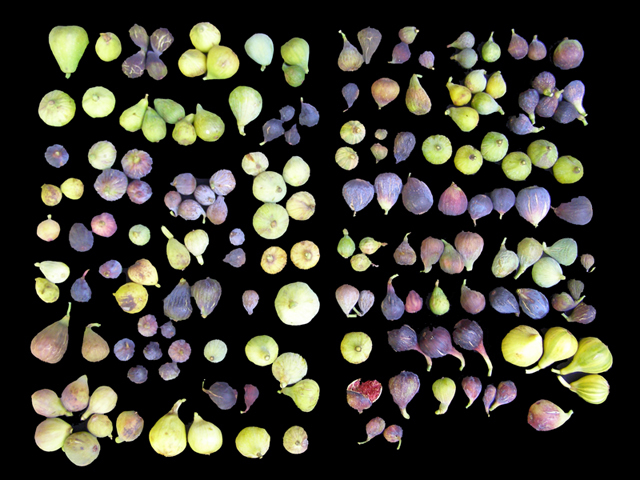 Fruit drop results when fruit that requires pollination is unpollenated. Fruits drop can result when a plant is stressed. Stress can be the result of excess heat, lack of rain or irrigation, excessive rain or irrigation, etc. Some varieties are reported to be more susceptible to fruit drop following heavy rains. The mark left on a branch at the point where the fruit was previously attached to the branch. 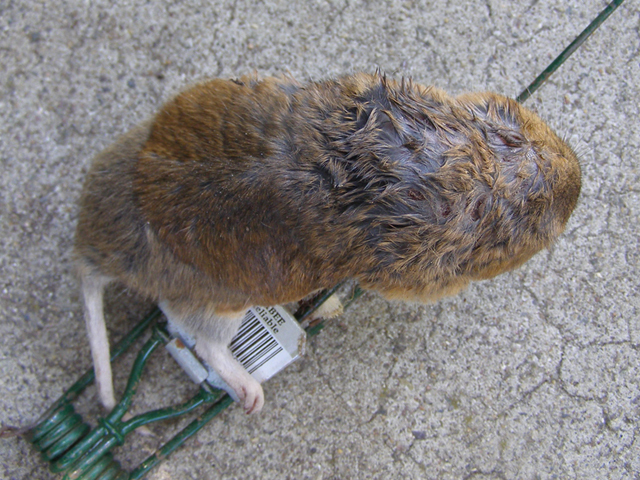 The Valley or Botta's pocket gopher, Thomomys bottae, which is the most likely gopher to be found in southern California, is one of several pocket gopher species found in the United States. A single gopher can have several hundred feet of tunnels. They definitely enjoy fig roots, and can completely consume all parts of a small tree that are below ground. It is quite possible for a gopher to chew off and kill a lerger tree with a trunk diameter of 2-4". There are various methods of control, but trapping is, perhaps, the best technique. It provides proof of kill, which some other methods do not. In most cases, a mound of dirt is the first clue that a gopher is present. That mound is usually on a side tunnel. If you dig a foot or two into the tunnel, you will find the main tunnel, and can set a trap in each direction. Flooding will not deter a gopher, and will probably make his digging that much easier. However, it can be a useful technique for locating where a tunnel leads, especially on a slope. It is important to remove or rip up as much tunnel as possible to prevent reuse by another gopher. An example of gopher damage. 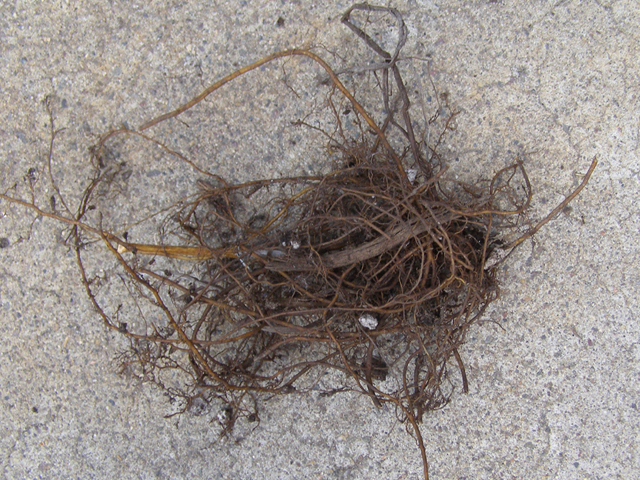 A second example, where the gopher ate about 12" of the stem above ground, and took the roots into his tunnel. 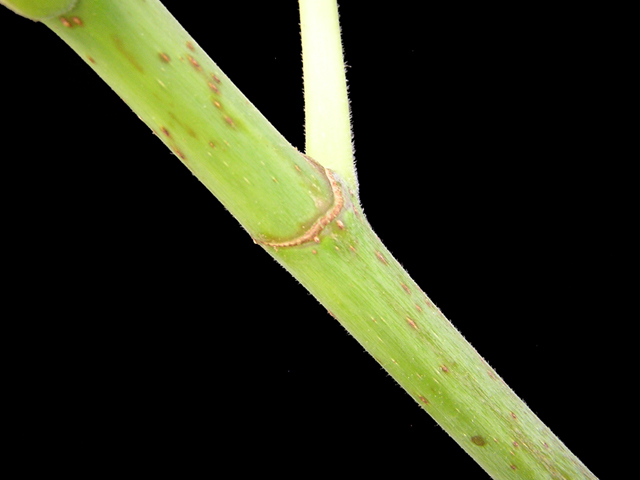 Grafting is one form of asexually producing additional plants which are identical to the parent plant. 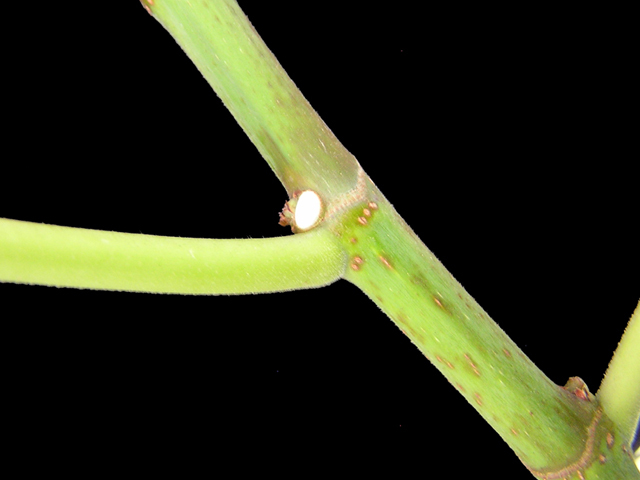 There are many online resources from which to learn grafting techniques. However, a hands-on demo greatly enhances the learning experience. 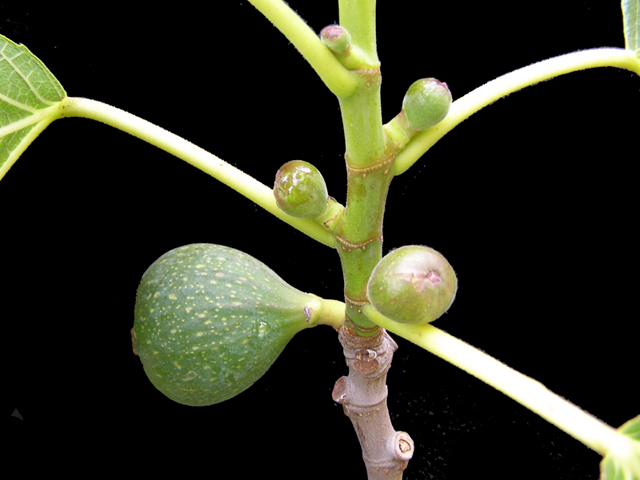 Several techniques can be used for figs, including wedge grafts and chip budding. For best results it is very important that the rootstock is actively growing. This wood formed during the current growing season, which has leaves attached to it, and which is generally green in color, until it begins to harden off in a process called lignification which occurs as part of the process of going dormant. This wood, as cuttings, can be used for propagation but generally requires greater care because of its "tender" nature which can cause it to dry out quickly. Green wood that is just beginning to harden, as evidenced by the browning spots. Green wood that is more advanced in the "hardening off" process, but still not fully hardened and not dormant. At their simplest, greenhouses are controlled environments. We usually expect them to be hot and humid. 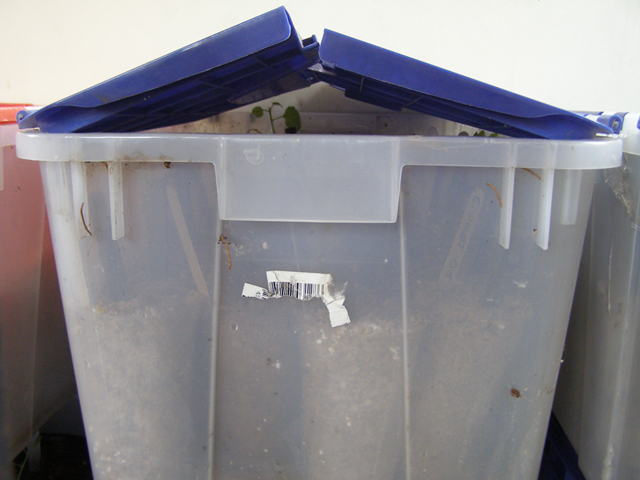 When rooting cuttings, you want to control humidity, first and foremost. 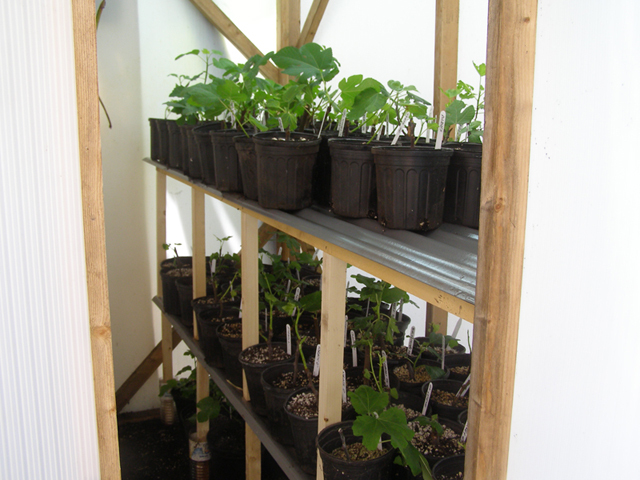 This can be done in a walk-in greenhouse, in a plastic bag, or in a plastic storage box. We can then control temperature by heating the walk-in greenhouse, but addding a heat source (such as a light bulb) into the storage container, put the storage container in a warm place, such as your living room, or the plastic bag on top of the refrigerator. A walk-in greenhouse. They do not need to be fancy, only functional. You can control temperature by using shade cloth, or adding a heater. In full sun, they can get too hot, so they will need ventilation. This can be done with fans, or openable windows on thermal sensors. Humidity can be controlled by misters, which also help moderate temperature. This is a Village Green greenhouse which, with a few modifications to strenghten it can hold about 100 1 gallon plants. It is quite inexpensive. 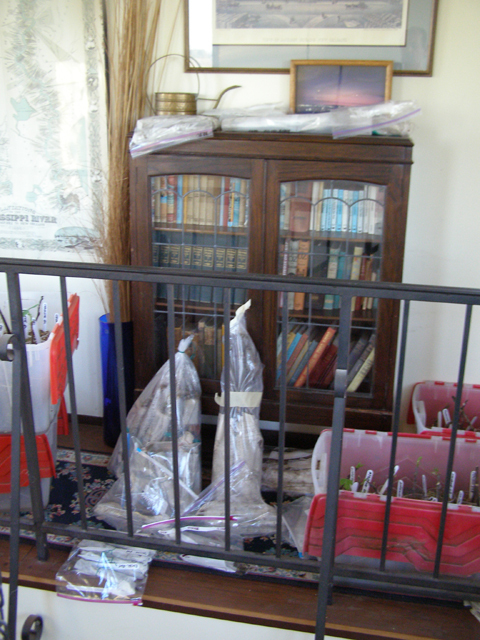 Cuttings in plastic bags in a warm upstairs location. The bag controls humidity and the indoor location provides the heat. Cuttings in a storage container. 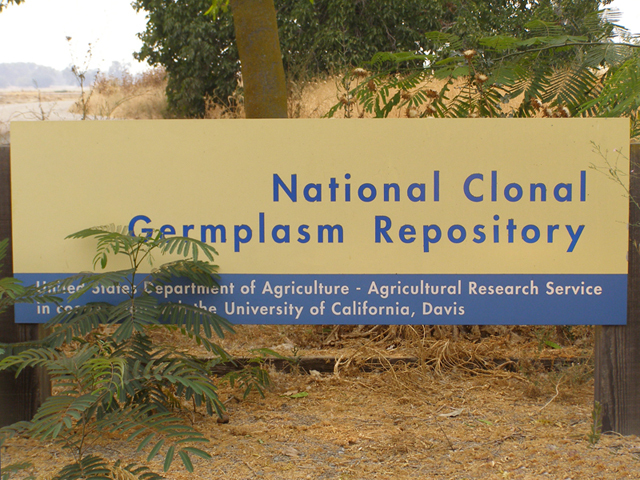 The Germplasm Resources Information Network's (GRIN) mission is to support four projects, the National Plant Germplasm System (NPGS), the National Animal Germplasm System (NAGP), the National Microbial Germplasm Program (NMGP), the National Invertebrate Germplasm Program (NIGRP). GRIN provides National Genetic Resources Program (NGRP) personnel and germplasm users continuous access to databases for the maintenance of passport, characterization, evaluation, inventory, and distribution data important for the effective management and utilization of national germplasm collections. The period of time, generally from Spring to Fall, during which a plant has the proper weather and climate conditions for active growth, fruit production, and fruit ripening. This period of time is influenced and/or determined by such things as "last frost date", temperature at your location, your latitude, "date of first frost", and general temperature of the growing season. Generally being closer to the equator (lower lattitude) promotes a longer season. In very tropical regions the season might actually extend for the entire year. The length of the growing season at your location will, most likely, influence your decision about what varieties to grow, such as earlier ripening or "short season" varieties, or possibly varieties with productive breba crops. Many figs will not have sufficient time to ripen in shorter season climates. Part of the process of new green growth turning to harder, browner wood is often called "hardening off". This is a process, known as lignification, which changes the structure of the branch to make it stronger and prepares the branch to survive colder winter temperatures. "Hardening off" also refers to the process of transitioning a young plant from an indoor or greenhouse environment to and outdoor and/or full-sun environment. This is often accomplished by moving the plant to partial shade for a period of time before introducing it to full sun. 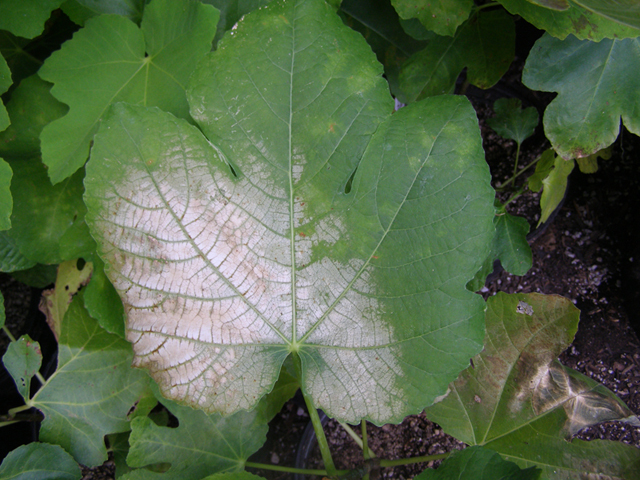 Plants that have been moved directly to full sun will often have their leaves turn white, display brown or crispy patches on their leaves, or possibly completely defoliate. Questions about harvesting are usually centered on "when" to pick. Generally, the temptation is to pick to soon. 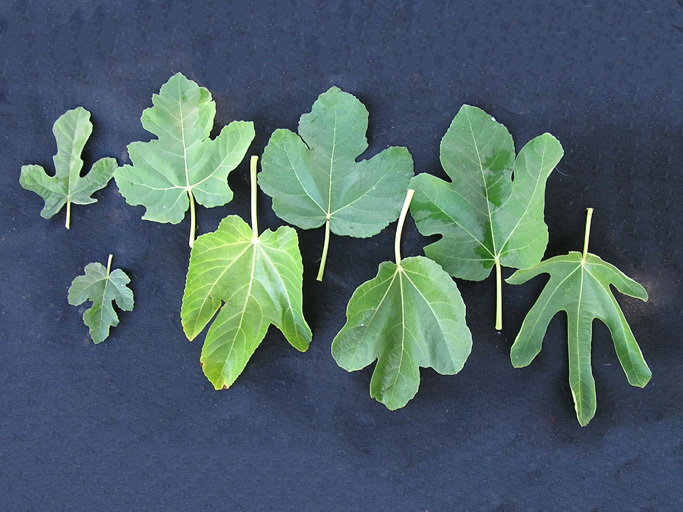 Determining the various signs of a perfectly ripe fig varies from variety to variety, so a little experimentation is usually required. There are some general guidlines and pictures of the various signs at the link below. Irrigation is the application of water to plants by man-made means (sprinklers, hoses, drippers, etc.) when rainfall is insufficient, infrequent or irregular. There are many was to apply water to figs trees. The timing, amount and method of application varies greatly depending on a great range of factors, among which are temperature, humidity, wind, soil type, use of mulch, shade, use of surrounding hardscape. Heavy soils such as clay retain water more readily than sandy soils. Water applied to clay soils will spread more laterally, while water applied to sandy soils tends to move more vertically. When water moves quickly down through the root zone, plants have less time to absorb it, so it must be applied more frequently and for longer periods of time. The addition of organic material to the soil, such as compost, can slow the passage of water out of the root zone. Humid environments reduce evaporation from both the soil and plants, reducing the need to water. Low humidity conditions, when combined with a consistent breeze or wind act almost like a convection oven, stripping moisture from plants much more quickly. Mulch and shade (upperstory trees, shade cloth, etc.) help reduce water loss, which usually reduces the need to irrigate as much. Water can be applied using drippers, micro-sprinklers, rainbirds, flooding, etc. The method of application depends on soil type, rate of application required, temperature, humidity, etc. Interestingly to me, the fig orchard at WEO, UC Davis, is irrigated with micro-sprinklers, even though they have low humidity, which leads to high evaporation rates. However, their soil is very, very heavy clay, and applying water any faster only leads to run-off. They have to apply it slow enough to allow it to soak in before it runs off. Leaves come in a variety of sizes and shapes. They can be useful in helping to identify an unknown fig. 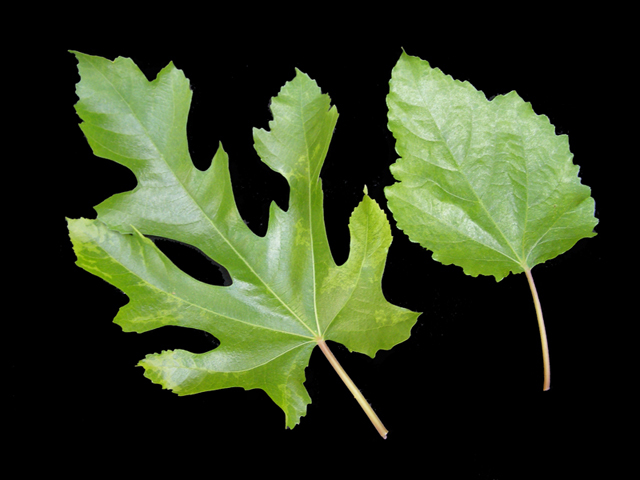 However, many varieties have nearly identical leaves, and most trees will have some degree of variation in their leaves. Some trees may be regularly charfacterized by more than one leaf type, such as Raspberry Latte. Using leaves to diagnose symptoms. Leaves are a "trailing indicator": that is, they report what has already happened or what the conditions were at some prior point in time. These leaves are typical of a plant that has been moved from a greenhouse environment to full sun or from shade to full sun without a period of transition (decreasing amounts of partial shade over a period of days or weeks). The leaves can be bleached by the strong sunlight, sometimes turing entirely white and falling off. These leaves are very tender new growth. This dry/wrinkled look could be caused by under-watering, excessive heat, low humidity or a combination of these factors. 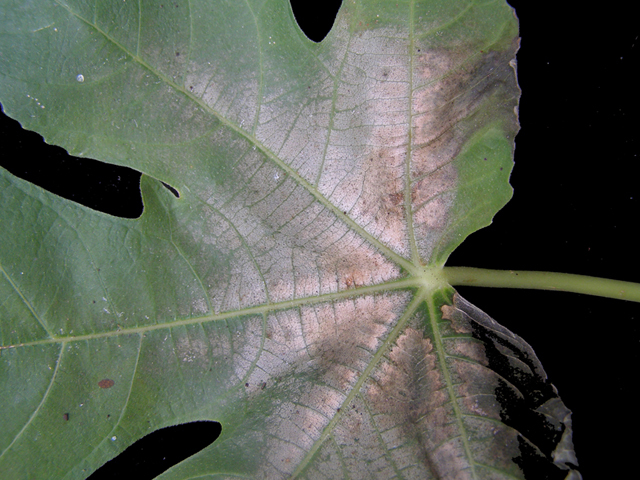 Tender growth exposed to high temperatures is unable to control loss of moisture like a mature leaf can, and will dehydrate easily in high temperatures, especially when combined with low humidity. 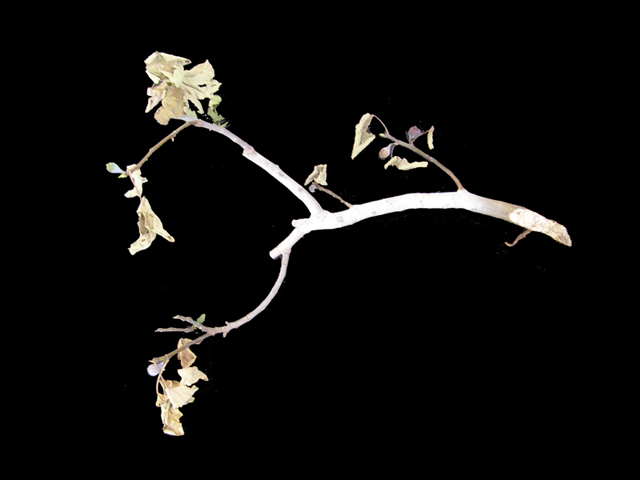 Wilted leaves are usually a sign that a plant is in need ot watering. Generally if the leaves have not started to show signs of burning or crispiness, a thorough watering will restore them to proper condition. In some cases, leaves can wilt because the plant cannot take water in because of root damage. This damage could the the result of gopher activity, repotting of the plant, digging in the root zone which damaged to roots, etc. 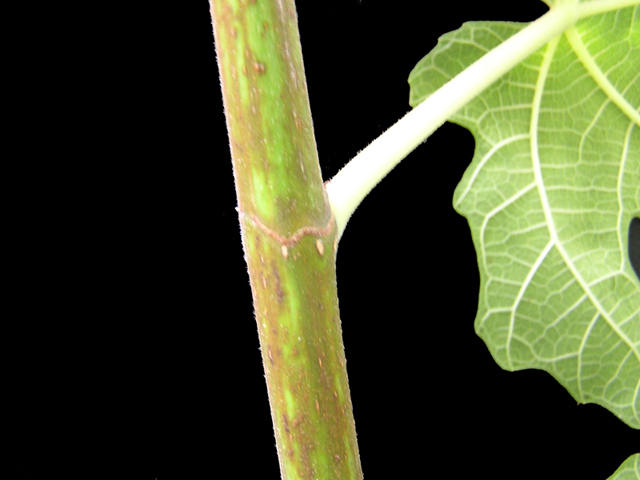 FMV will manifest itself in blotchy colored leaves, and distorfted leaves. The mark left on a branch at the point where a leaf was previously attached to the branch. 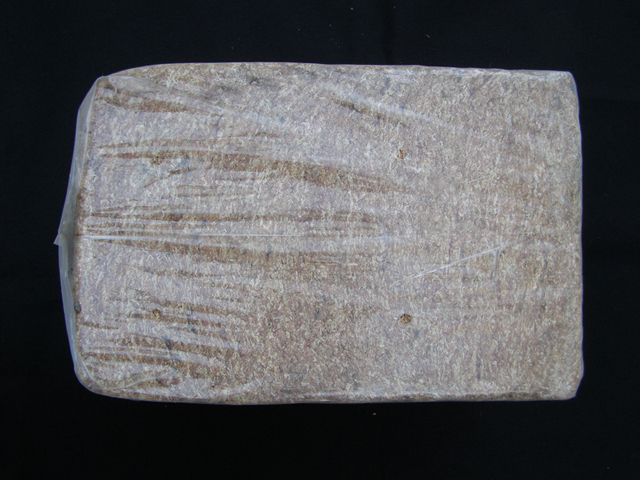 Lignification is the plant cell wall process by which the lignin polymers that hold the fibers together are produced. Lignins add structural rigidity to the cell wall, aid in water transport up the plant stem, and function in defense against various pathogens. The current theory, based on that developed some 50 years ago, holds that the polymerization process is under simple chemical control. That is, unlike the synthesis of proteins and carbohydrates, for example, enzymes or proteins are not directly involved in preparing the polymer. The theory continues to accommodate all of the currently known facts. Found in female common figs. Fruit produced on current season's wood. Also known as the Summer crop, or Mammoni in Italian. Italian for the third or Winter crop. Fruit produced on current season's wood. Also known as the Summer crop. Fruit produced on wood which grew in the previous season. Also called "breba" or the Spring crop. There are several reasons for pruning, and tghe purposed of pruning will often determine how to go about pruning: which strategies and techniques to use. 1st consideration: for new or small trees: do you want a single trunk, or multiple trunks? If you want a single trunk (most likely a larger tree with a higher canopy), you obviously need to prune off all but the straightest or dominant shoots. If you want multiple trunks, then you will probably need to pick the 3-4 shoots/branches that provide a nice shape and spread. 2nd consideration: do you want a tree or a bush form? 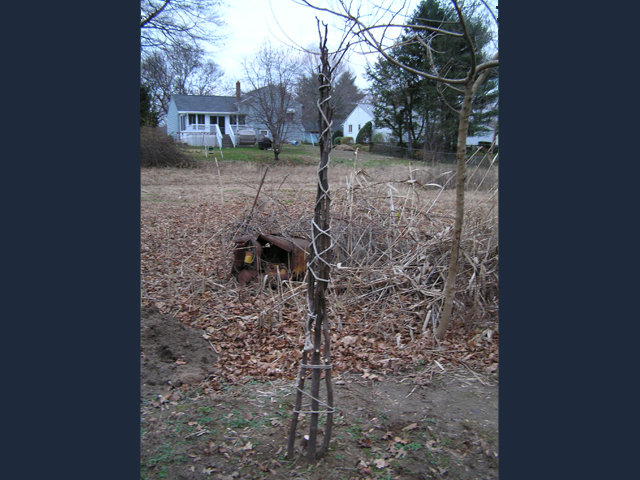 If you want a bush, prune in the early spring, just before it breaks dormancy, to 12-18" tall (what I do). 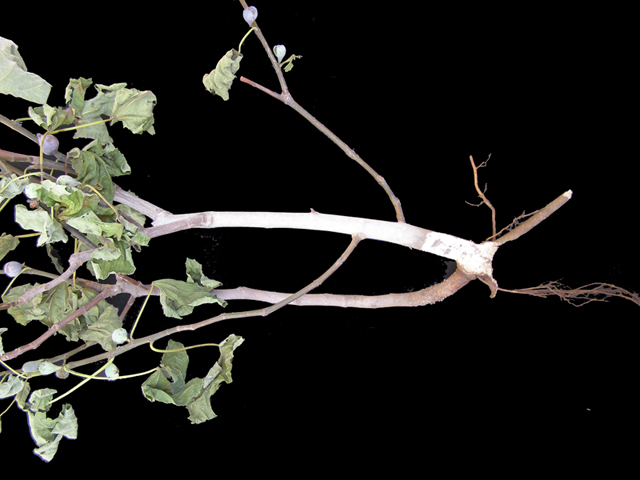 This will force low-branching in most cases, though some plants seem intent on growing straight up with a single shoot. If you want a tree, you will most likely want to go with a single trunk (see #1 above). 3rd consideration: if you want to grow it espalier, you probably want to prune it to 2 trunks, and begin training them horizontally, at a fairly early age when they are still qauite pliabe. Alternatively, you can bend a single shoot horizontally, and when the lowest bud begins to grow vertically, bend it horizontally in the opposite direction to form a balanced framework. 4th consideration: You may want to encourage earlier fruiting on a little older tree, in which case you would consider "pinching" (search for many posts on the subject at the Figs 4 Fun Forum). Pinching is a form of pruning, that is done at a specific time in a specific way for a particular goal. 5th consideration: on an older tree, you might want to thin interior branches to increase light and ventilation to the canopy of the tree. Remove branches which corss over one another or that are crowded, or that have narrow crotch angles. 6th consideration: since manin crop figs are produced on new wood, and most varieties do not have a breba crop, you can prune quite extensively to control size and height. 7th consideration: Pruning is also a source of cuttings for propagation. in warmer climates you would take them when dormant, maybe as late as January or February. In colder climates where freezing and damage to the branches is a consideration, you might take the cuttings in the Fall before they can be damaged. 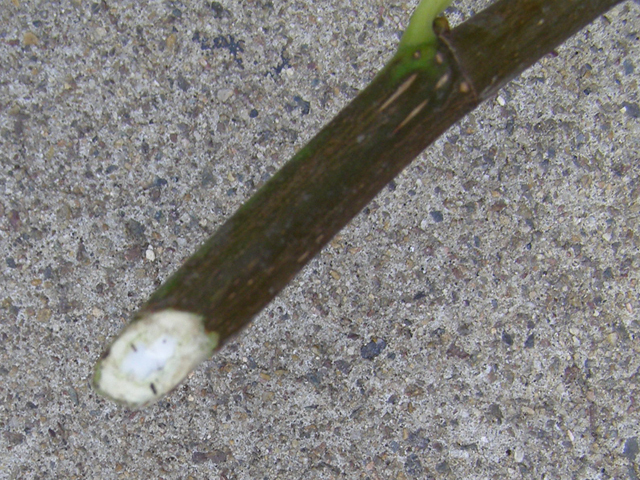 If you summer prune to force branching, the green-wood cuttings can also be used for rooting. 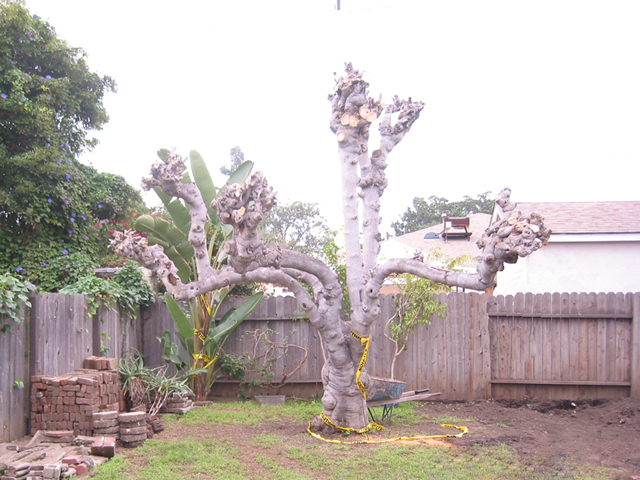 8th Consideration: Fig trees can be pruned and trained in an espalier style. 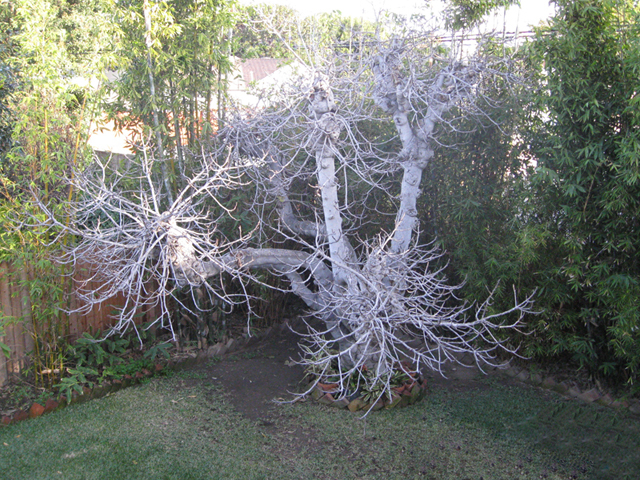 This is an example of a tree that has been "pollarded". Ripeness is often a matter of individual taste. Generally greater ripeness means that the fig has more sugars and flavor. If sap exudes from the stem when picked, it is definitely not ripe. See: Growing Tips: Harvesting for characteristics that help you determine ripeness. Each variety has its own group of characteristics, and often a little trial and error will help you "read" a particular variety. 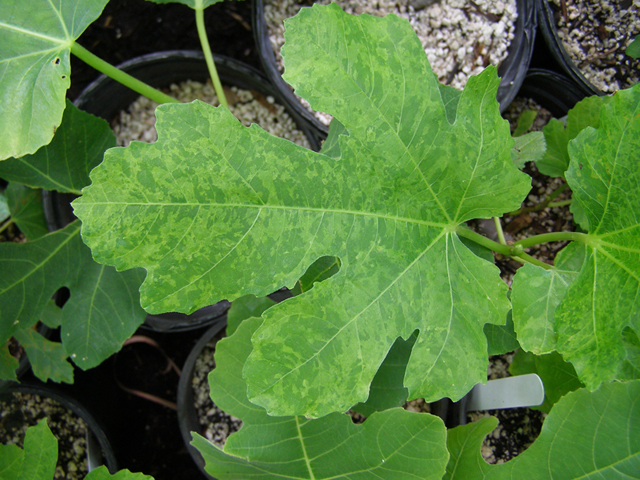 Soil-borne pest that affects many different plants, including figs. Can be transmitted in contaminated soil, or contaminated plants. 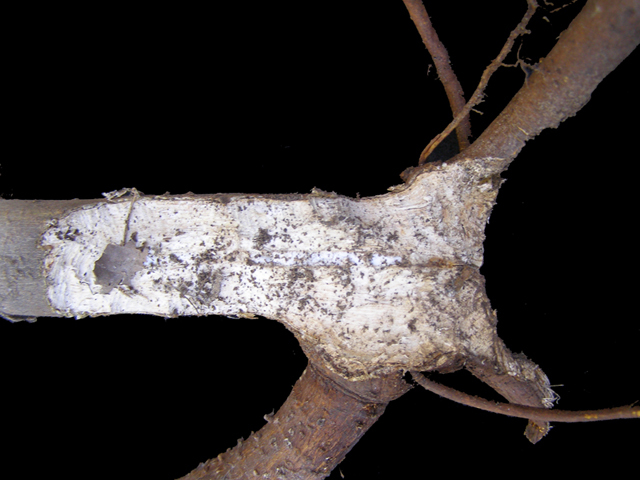 They proliferate inside the roots and interrupt nutrient flow which generally leads to stunted growth. 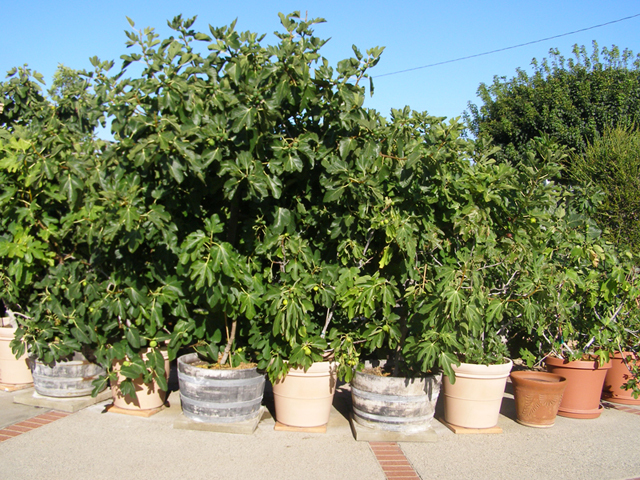 Figs grown in pots gradually fill the pot with roots and the soil volume diminishes. This leads to the inability of the rootball to hold sufficient water, and to a loss of vigor. Removing the plant from the pot, and pruning away some of the roots allows for the addition of new soil and allows space for new feeder roots to grow. This is often done every 2-3 years. See Growing Tips for more info on growing in pots. 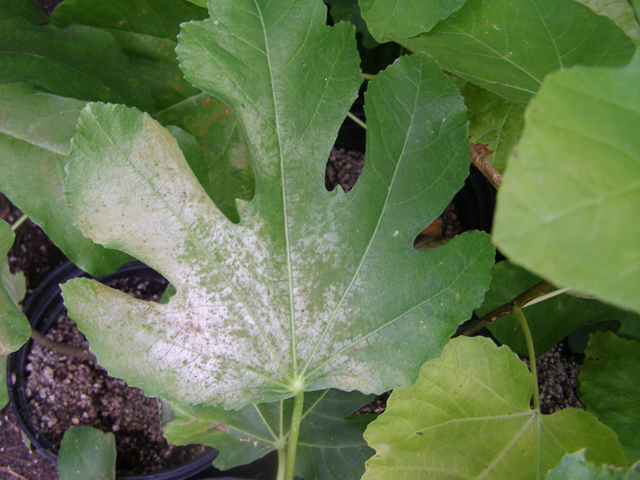 A disease that thrives in humid climates and which can defoliate a tree. 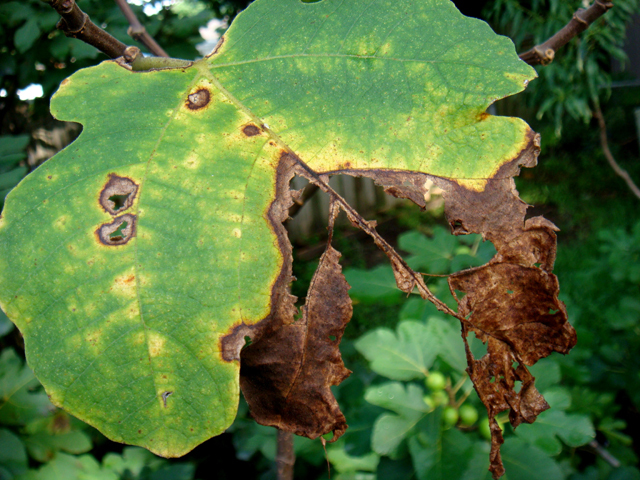 Fig rust is common on various Ficus species in tropical and subtropical regions of the world. 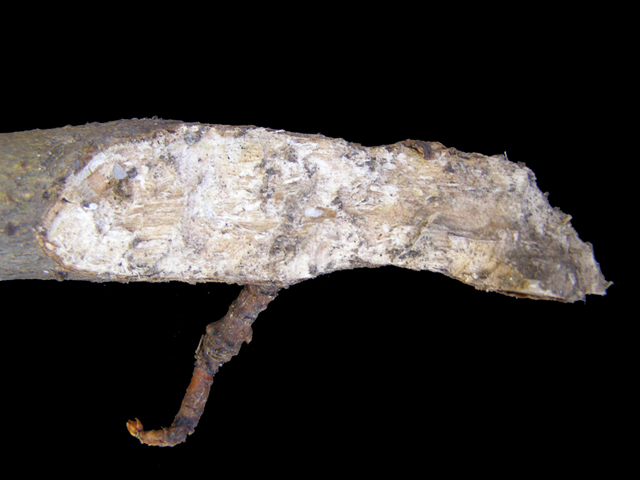 lt is said to be troublesome on F carica in the states along the Gulf of Mexico. often causing severe defoliation of the trees (Edgerton 1911; Lanham, Wyche, and Stansel 1927). lt occurs rarely if at all in California. 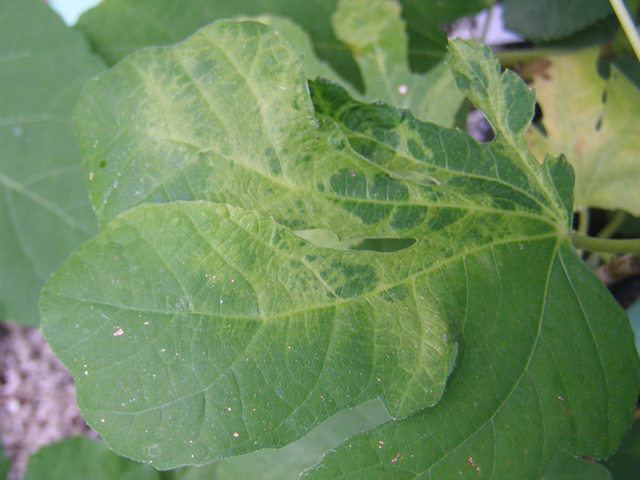 Symptoms of the disease include dying of the leaf blade from the margin inward and. eventually. defoliation. The rust pustules are numerous. small. raised, and light salrnon-colored. and develop on the undersurface of the leaves. The causal organism is Cerctelium (Pltysopella) fici (E. j. Butler) Arth. 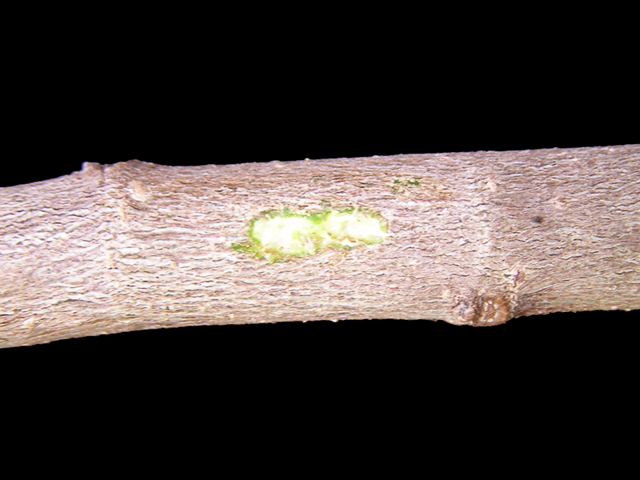 The rust fungus produces only uredo- spores, which are ellipsoid or obovate-globoid. I4 to Z} by l8 ro 32 um, and pale yellow, and tel pores. which are broadly ellipsoid or oblong, IO to 13 by IS to ZZ um. colorless and produced in chains of 2 to 7. This may be rust, or a severe form of FMV. Not sure, yet. 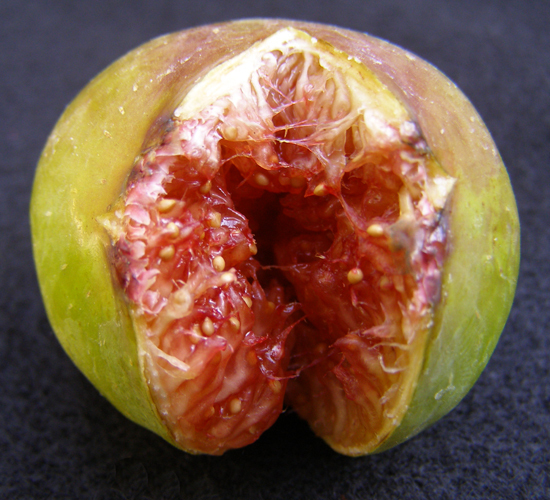 A category of figs which set a breba crop without pollination, like a common fig, but require pollination for the main crop figs to persist, like a Smyrna type fig. Examples include Desert King, White King, and Dauphine. 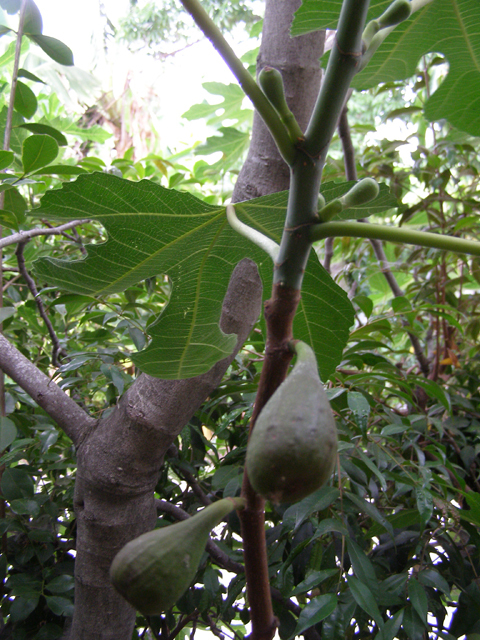 A specific variety of fig from which the San Pedro category derives its name. Also called latex, it is the liquid portion of fig plant material which oozes from branches, leaf stems and leaves when they are cut, puruned, borwken or damaged. 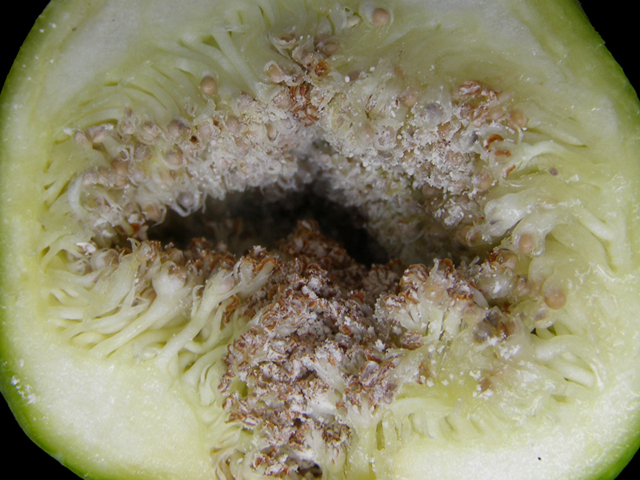 Viable seeds are sexually produced by pollination of a female fig and pollen from a caprifig. Because they are sexually produced, they contain genetic material from both their male and female parents, and will not produce a plant that is identical to the parent. The best examples of this variability in the USDA collection at UC Davis's Wolfskill Experimental Orchard are DFIC0164.1 through DFIC0164.9 which were grown from seed obtained from Croatia (?). The other example in the USDA collection is DFIC0260 Encanto which is a seedling of Vista Black Mission, produced and selected at Encanto Farms Nursery approximately 2001. 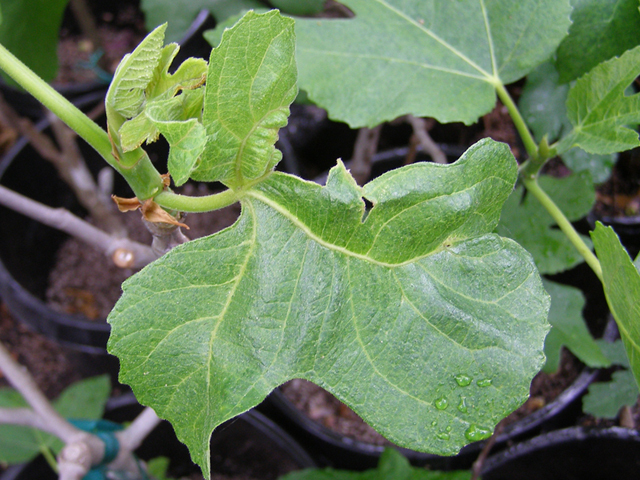 One half of seedlings will be caprifigs, functionally male and not suitable for eating. The balance will be edible, but the fruit may not be palatable, or, in some cases, not produced at all, or after a long period of juvenility. For these reasons, apart from specific breeding programs, seeds are seldom (if ever) used as a source of fig trees for home or commercial orchard use. This is most easily accomplished by pruning. Some varieties are less vigorous growers, but few, if any trees are truly dwarf in size. Fig fruits can have skins which are fairly thick and leathery, or ones that are thin and almost imperceptable. 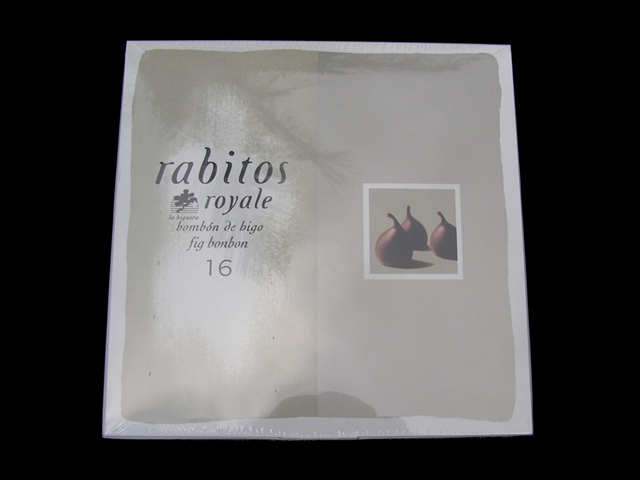 In some varieties, the skin in an integral part of the fruit which provides flavor and sweetness. 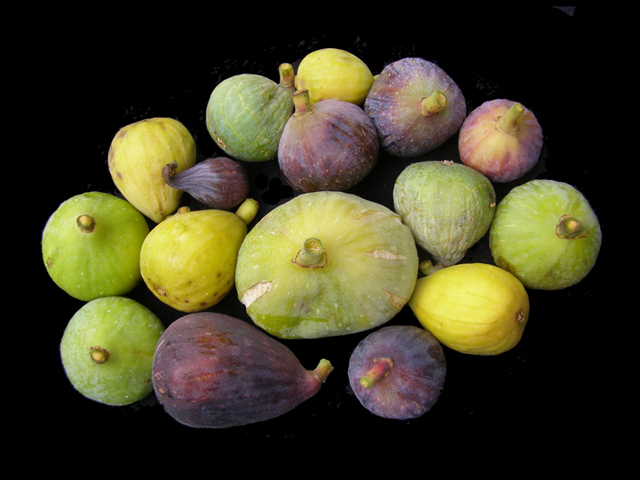 A category of figs which requires pollination to set the main crop. [Smyrna types only have main-crop figs and do not produce brebas?] The most well know examples of this type are Smyrna and Calimyrna. Souring or fermentation of the flesh of the Fig fruit. a widespread disease of long standing (Caldis l9}O; Haring 1922; Howard l90l). occurs in all three types of Q. It is caused by various yeasts. Symptoms. 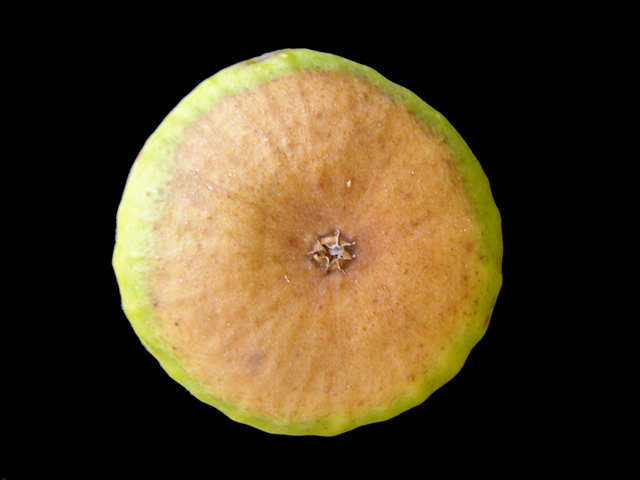 First symptoms are noticeable when the fruit begin to ripen and the "eye" is open. 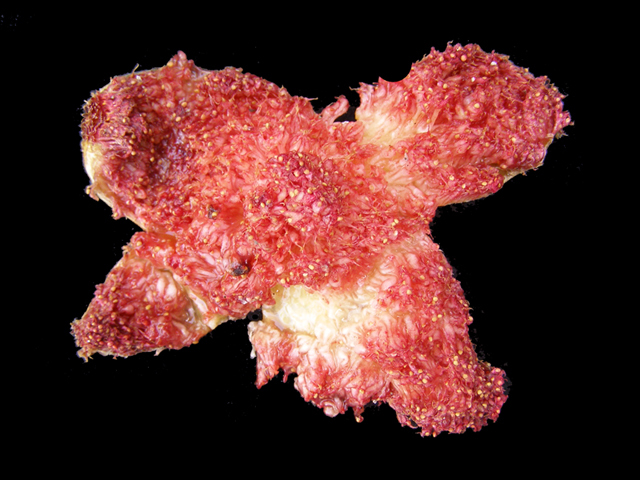 The inner flesh (pulp) of the fruit first develops a pink color, and later becomes watensoaked. A pink liquid exudes from the eye. Gas bubbles detectable in the pulp give off a strong alcohol odor. ln late stages of the disease a scum of the yeast organisms collects in the watery pulp. 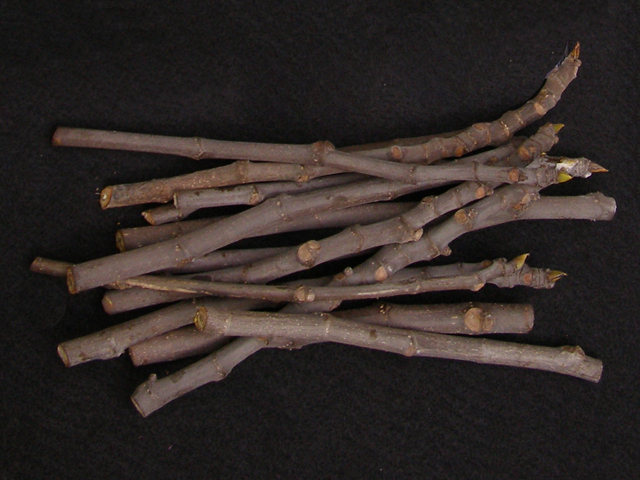 Affected fruit lose their firmness and later dry up on the twig (Q. S). Disease development. 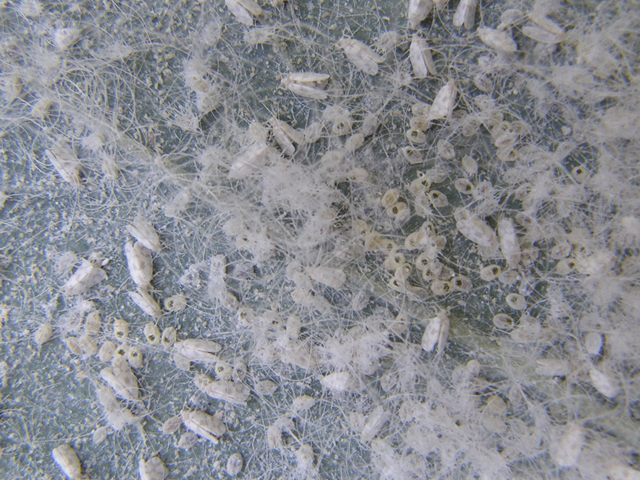 The dried-fruit beetle (Carpophilus hemiptems) and fruit flies (Drosophila spp.) are responsible for diseminating the yeast cells from fruit to fruit. These insects are attracted to fermenting fruit, and since they are small enough to enter the eye of the fruit after the eye scales are shed, they can carry the yeast into the fruit. Control. Little can be done to control the disease. but recent research (Obcnauf et al. 1982) suggests that its incidence in Smyrna-type figs could be reduced but not effectively controlled through the use of certain fungicides. 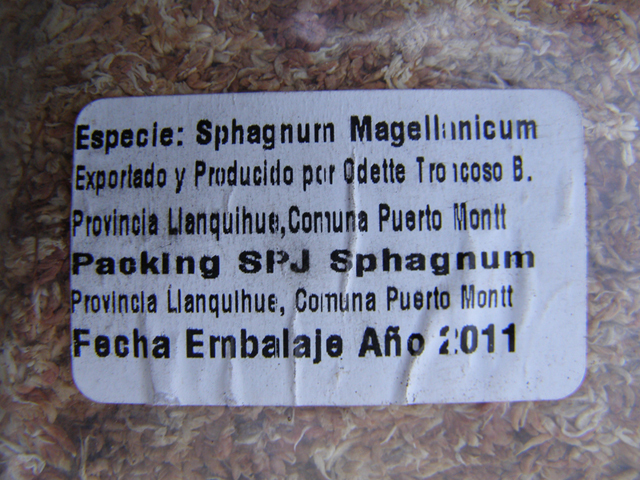 The long-fiber form of sphagnum moss is sometimes used in potting mixes. Can also be used as a moisture holding medium in rotting mixes, or by itself for rooting. 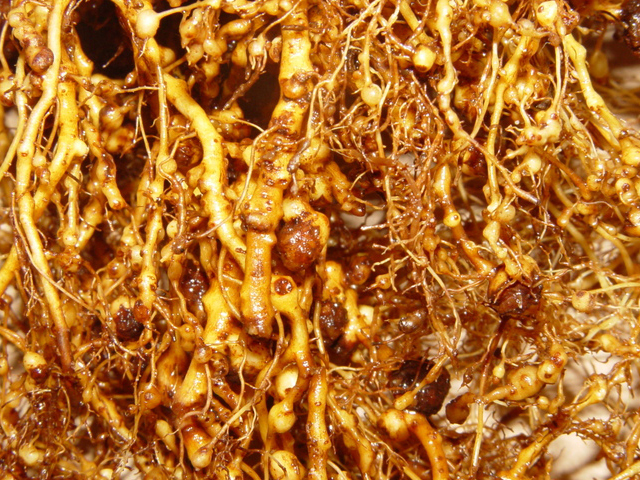 There is anecdotal evidence that it has mold-inhibiting qualities when used for rooting. The moss pictured here was 6 CF, 11 pounds and can be purchased through Amazon.com or elsewhere. A condition where the skin breaks, exposing the inside flesh or pulp of the fruit, resulting in the loss or inedibility of the fruit. Generally a shoot which grows from the roots or from the trunk of the tree near or below the soil line. in the absence of any soil diseases, this often make a convenient way to propagate a new plant. They can often be removed with at least some roots, making "rooting" much quicker and easier. Fig fruit can be sunburned when temps are excessive, especially when they are not shaded by the leaf canopy of the tree. This will often make the skin more leathery, but will probably not hurt the flesh of the fruit inside. If the sunburn is evidence of excessive heat exposure, then the flesh inside has probably been "cooked" or overheated and is not edible. If heat and sun are excessive (say in Phoenix, AZ), you can paint the trunk/shoots white with a mixture of 50% water and 50% LATEX (water-based) paint. Do NOT use oil-based paint. You can also wrap, loosely, with white paper to shade the bark. Both are commonly dne with planting of new fruit trees (citrus, stone fruits, etc). The fig tree (Ficus carica) is a plant native to the Mediterranean region. The edible part of the fig, called the 'fruit' is not really a fruit at all, it's a synconium. A synconium, in the fig's case anyway, is a green globe with an opening on one end. Inside the synconium are a cluster of hundreds of flowers. If pollinated, these flowers produce drupelets, tiny bubbles of fruit material with a seed in the center. 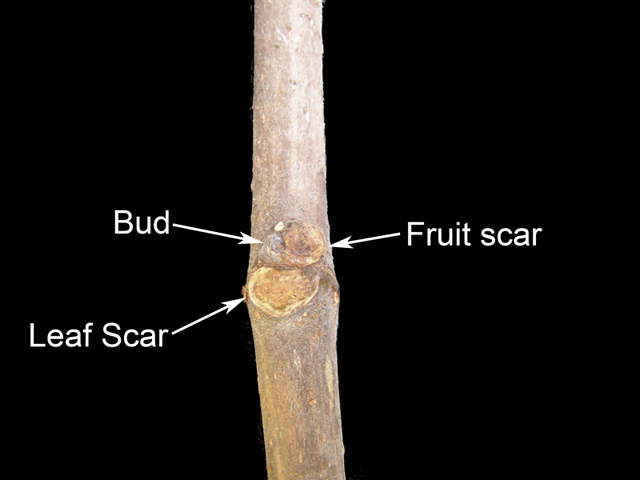 The vegetative bud which forms at thed end of each branch. 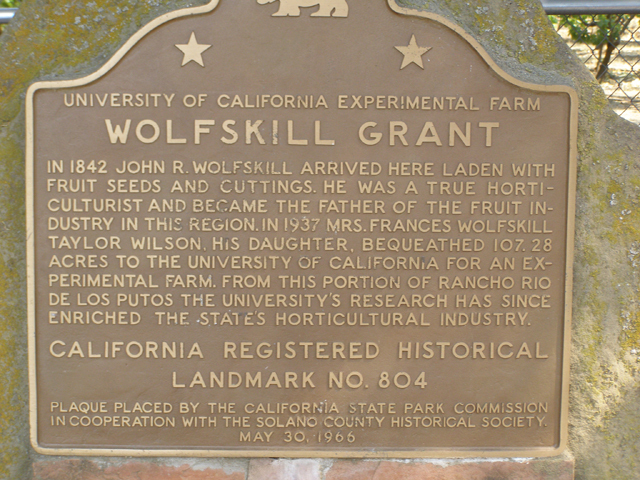 The USDA maintains its National Germplasm Collection of Figs (and several other fruits and nuts) at the University of California, Davis on a property known as the Wolfskill Experimental Orchard (WEO). Occasionally, a cutting that you are trying to root was started upside-down. 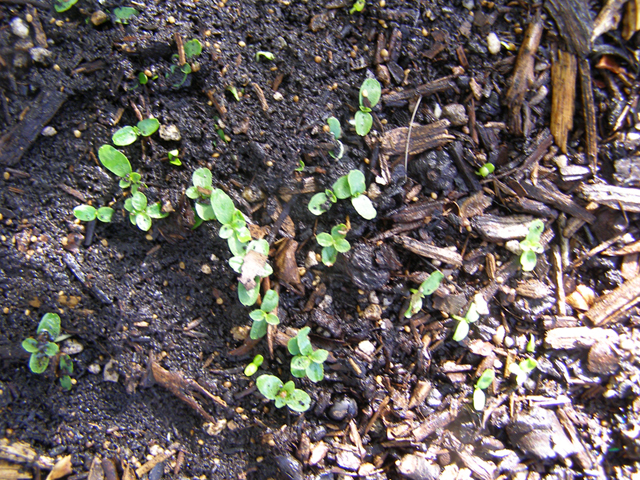 Most will root, but the buds will need to emerge under the soil, and make a "u-turn". Most cuttings in this situation are not successful, but some do survive and thrive. Ficus carica consists of many varieties, which are distinguished mainly be the size, shape, skin color and flesh color of the fruit. Fig trees are symbiotic--that is to say, they can only survive to reproduce with the assistance of another creature, in this case a fig wasp. 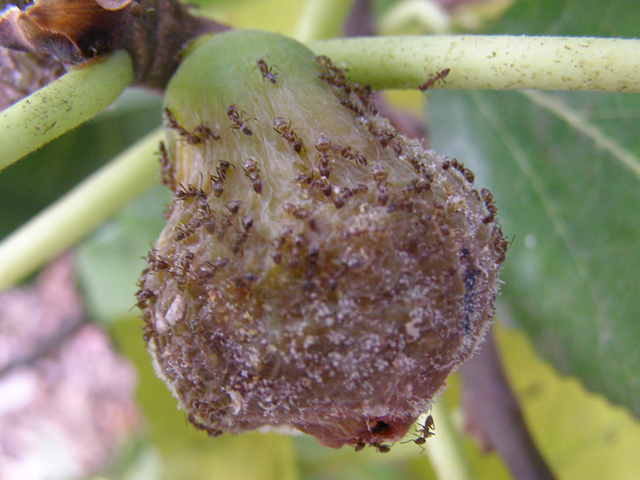 Without the fig wasp's pollinating activities, the tree would never produce a germinated seed for the next generation; alternatively, the fig wasp would never survive without the fig tree's food and shelter. At the proper time, female fig wasps enter the opening of the synconium, and attempt to inject their progeny (eggs) into the flowers. 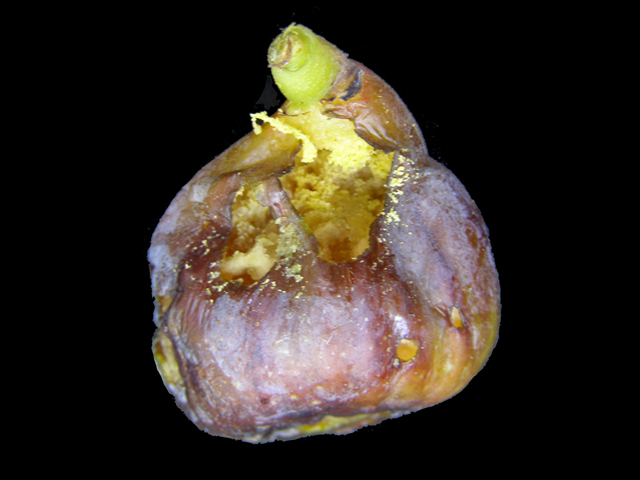 If fig wasp eggs are injected into the short hermaphrodite fig flowers by their mothers, the new fig wasps feed on the developing fruit and spend most of their lives within the synconium until they reach adulthood. Still inside the synconium, the females are fertilized by the males and then the females gnaw their way out of the synconium. On the way out, their bodies are dusted with pollen. Their sole remaining job in life is to find another synconium, enter it, inject their eggs, dust the pollen off their bodies and die. Also known as Giant Mexican White Fly. Can be somewhat controlled with frequent "pressure-washings" with a garden hose. Elimination of of preferred or host plants, such as hibiscus, from the landscape will also diminish the population. Their lifecycle increases and decreases with temperature. The time between generations is much shorter in the warmer months of the year. There are systemic pesticides that can be used on ornamental plants to control or eliminate fly populations, which are typically effective for 6 months to 1 year before needing to be re-applied. It is not known if any are listed for use on figs or other fruiting plants. 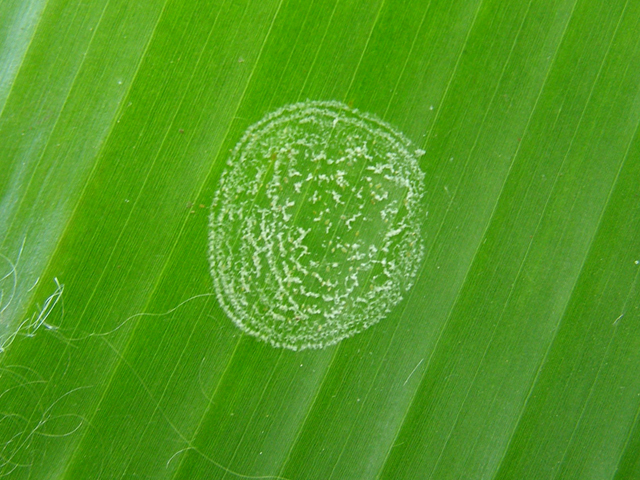 Typical "whorl" patterns of eggs layed on a leaf. Typical whorl pattern with adult flies hatching or emerging. Winter protection is a process or strategy for preserving a tree from the affects of colder temperatures, especially temperatures below freezing. Figs seem to withstand some temperatures below freezing, but are often damaged by frost and freezing temperatures. There are many forms of winter protection. The most common ones are wrapping/insulating, burying, and moving the plant to a warmer location. 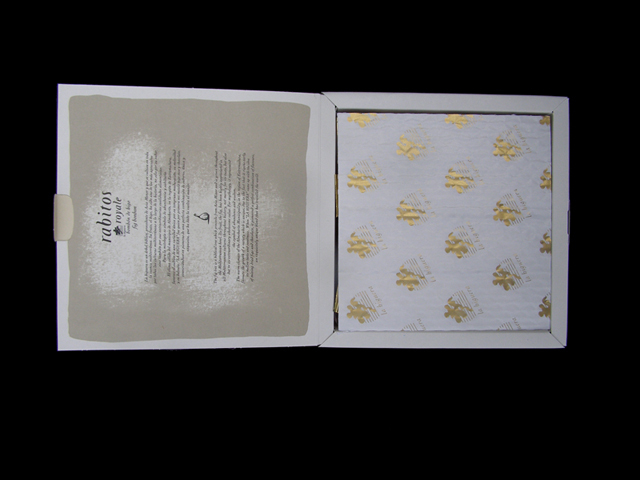 Wrapping involves using some form of insulation, which might be leaves, blankets, building insulation, or the like. 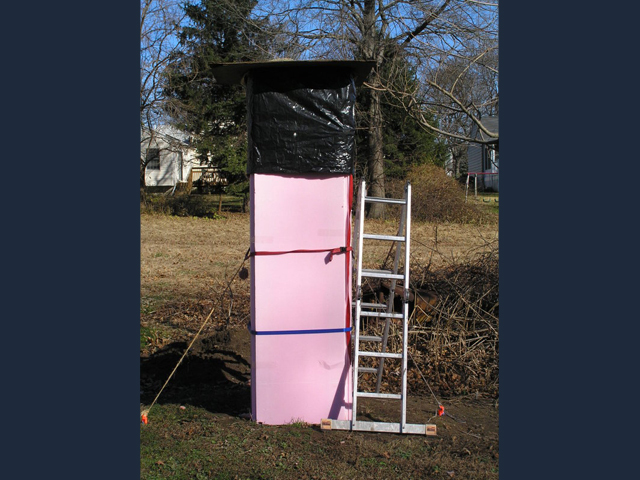 This insulating material is then protected from moisture by covering it with plywood, a tarp, plastic sheeting, etc. Burying is accomplished by cutting the roots on one side of the tree, and leaning it over into a trench dug on the opposite side of the tree. 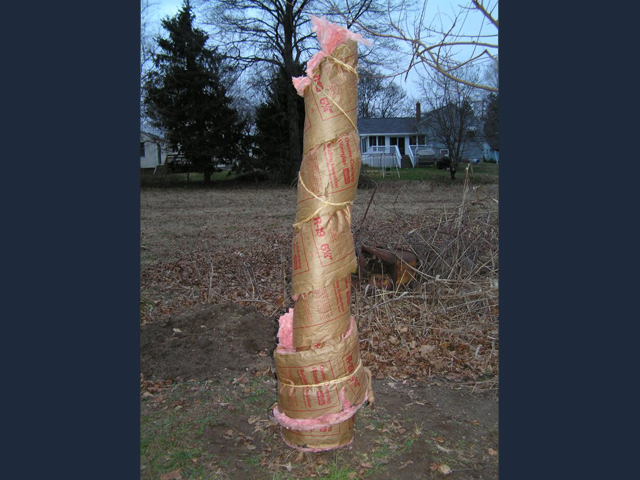 The tree is then covered with leaves or insulating material, then a waterproof layer, and finally covered with soil. In Springtime the tree is uncovered, uprighted and staked for the growing season. Plants grown in pots are more easily brought into a shed or garage for the winter, where the temperature can be maintained above freezing.